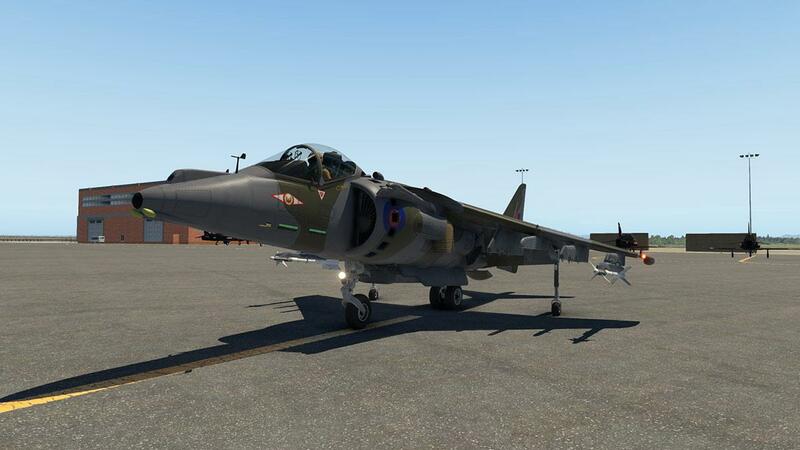 The AV-8A/B version of the Harrier is in essence a version Mk ll of the famous and highly versatile British Hawker Siddeley "Jump Jet". 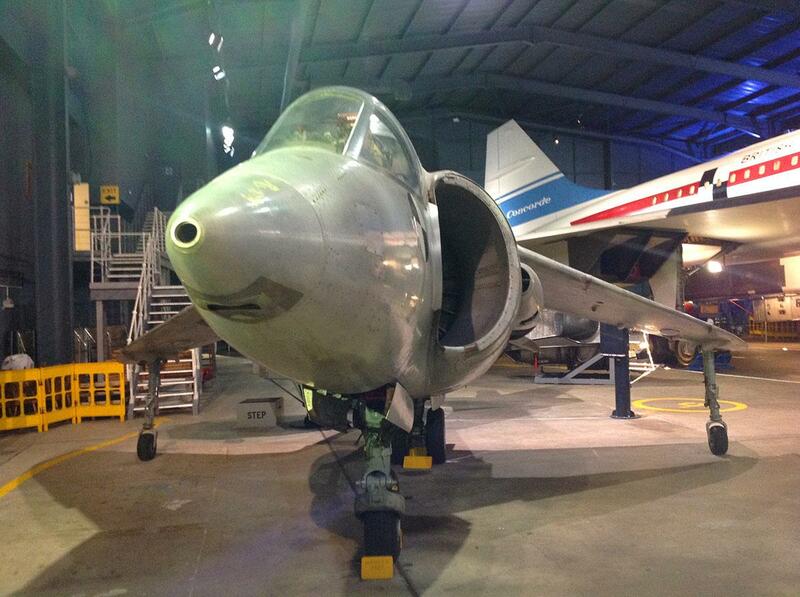 The Jump Jet story starts with the Hawker P.1127 and the Hawker Siddeley Kestrel FGA.1. 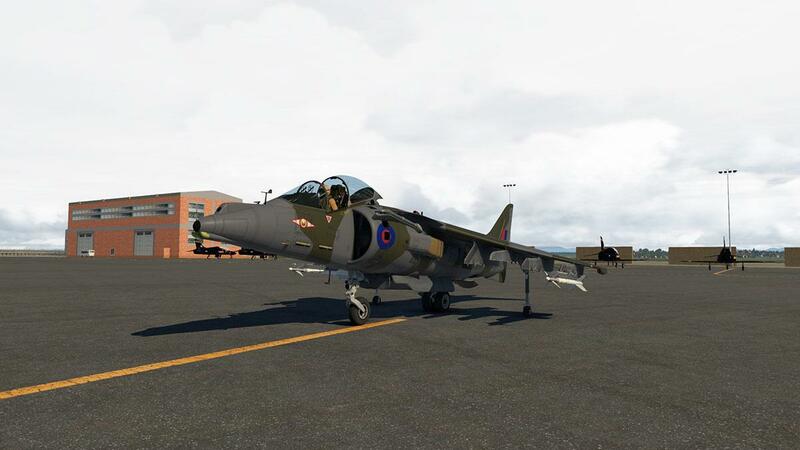 Both are the experimental and development aircraft that led to the Hawker Siddeley Harrier, the first vertical and/or short take-off and landing (V/STOL) jet fighter-bomber. The P.1127 development began in 1957, in taking advantage of the Bristol Engine Company's choice to invest in the creation of the Rolls Royce Pegasus vectored-thrust engine. Tethered testing began in July 1960 and by the end of the year the aircraft had achieved both vertical take-off and horizontal flight. It was not an easy program with the first three aircraft crashed during testing, and one aircraft was lost at the 1963 Paris Air Show. From the start most Air Forces didn't want the slow sub-sonic Jump Jet. Their eyes and money was always on the fast jets or supersonic target delivery. The Hawker Siddeley team created the P.1154 for the supersonic requirement as the design used a single Bristol Siddeley BS100 engine with four swivelling nozzles, but the NATO requirement was cancelled shortly after in 1965, along with that other great British hope the BAC-TSR-2. 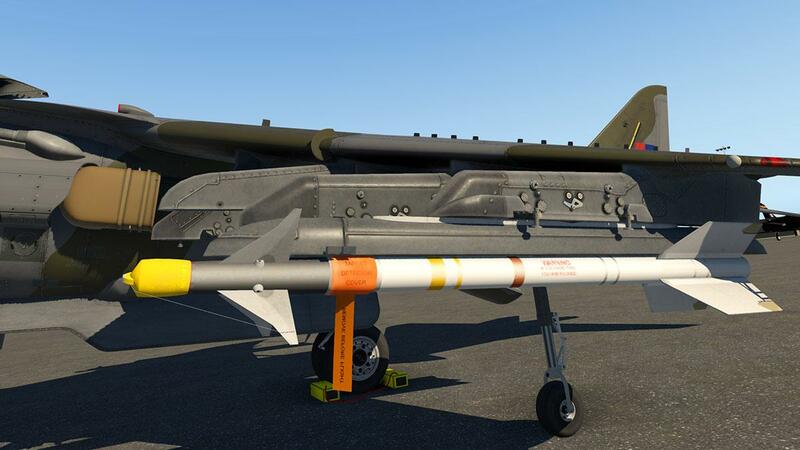 RAF however began considering a simple upgrade of the existing subsonic Kestrel and issued Requirement ASR 384 for a V/STOL ground attack jet. Hawker Siddeley received an order for six pre-production aircraft in 1965, designated P.1127 (RAF), of which the first made its maiden flight on 31 August 1966. 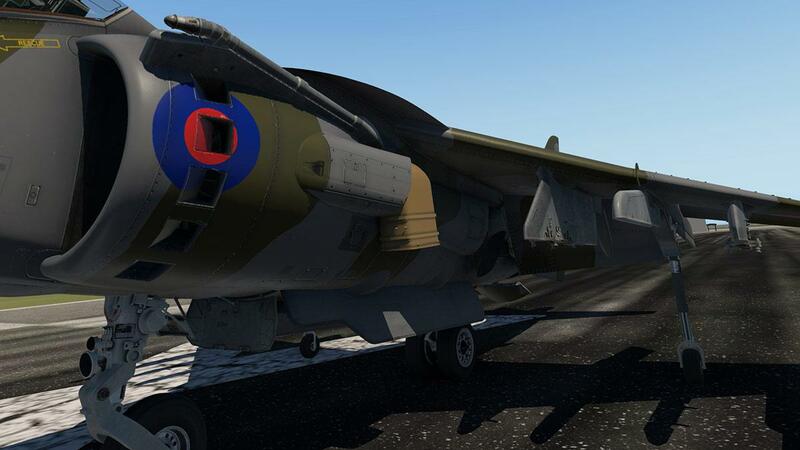 An order for 60 production aircraft, designated as Harrier GR.1 was received in early 1967. 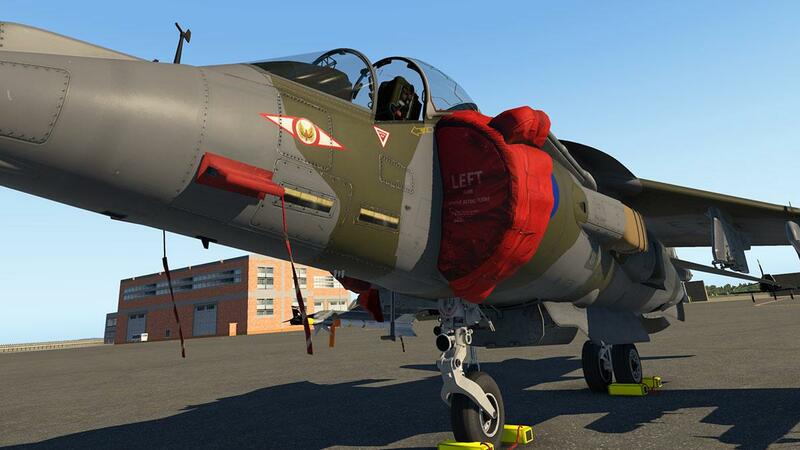 The aircraft was named after the Harrier, a small bird of prey. 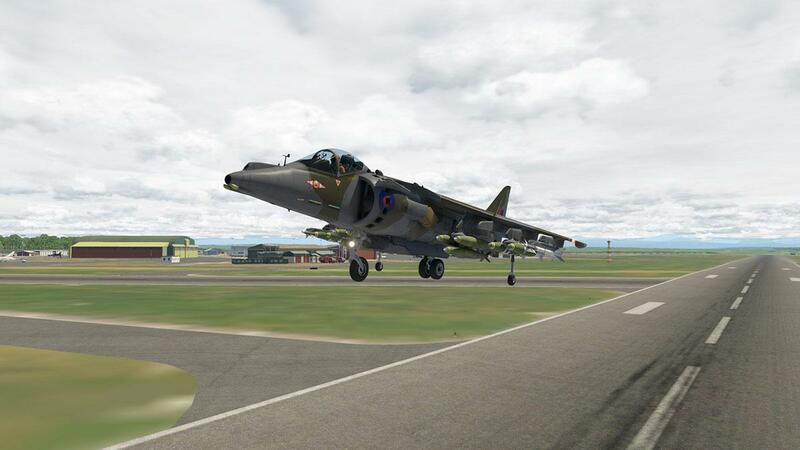 The Harrier GR.1 made its first flight on 28 December 1967. 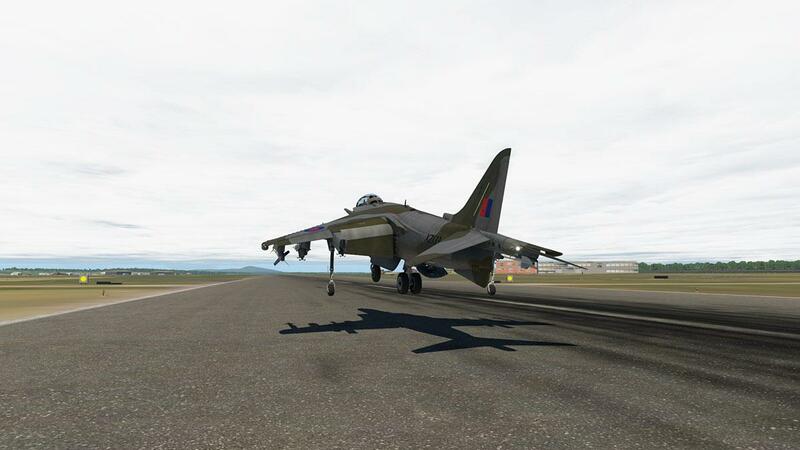 It officially entered service with the RAF on 18 April 1969. 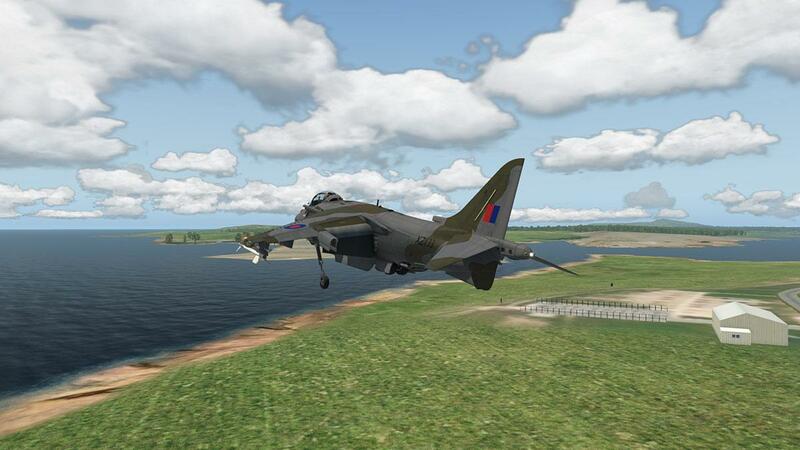 Almost immediately into service the RAF Harrier made the headlines! The aircraft won the The Daily Mail Trans-Atlantic Air Race which was a race between London, UK and New York City, USA to commemorate the 50th Anniversary of the first trans-atlantic crossing by John Alcock and Arthur Brown. The race was held between 4 and 11 May 1969. The 50th anniversary of the race is right now. The race was actually a race of individuals between the Post Office Tower in London to the Empire State Building in New York. Each of the individuals or "Runners" had to use some form of air transport. With a number of different categories a total of 21 prizes could be won. A number of point-to-point world records for aircraft were broken. 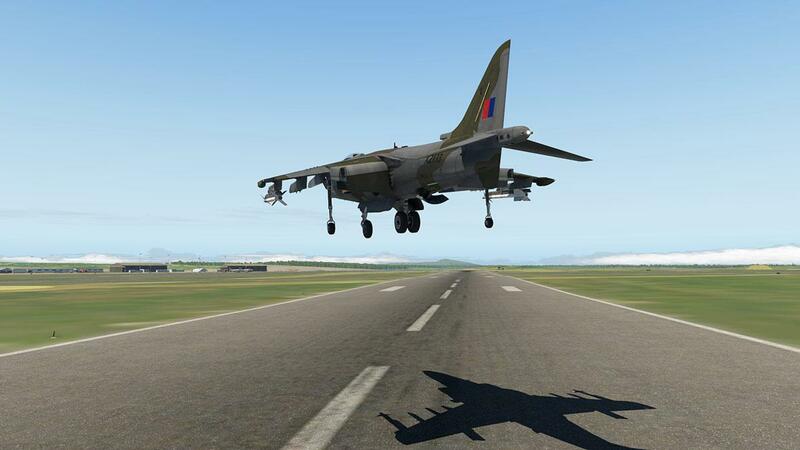 The shortest overall time between London and New York was by Squadron Leader Tom Lecky-Thompson flying a Royal Air Force Hawker Siddeley Harrier in 6 hours 11 minutes . 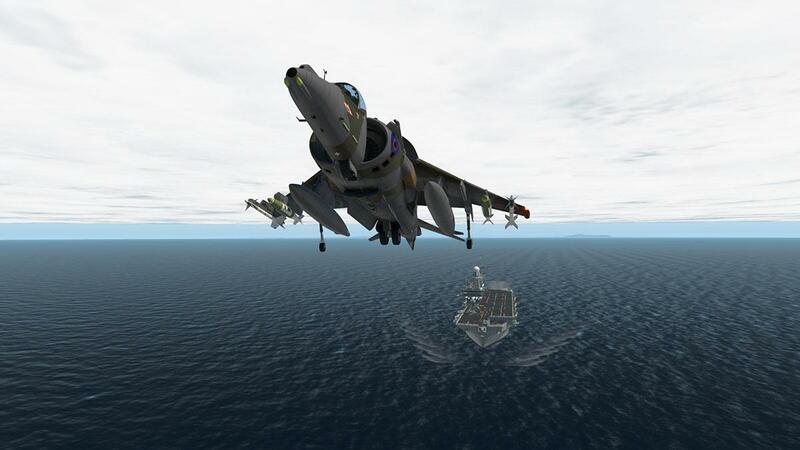 The Harrier used a coal yard next to St Pancras station in London and landed on the quayside of the Bristol Basin in New York. 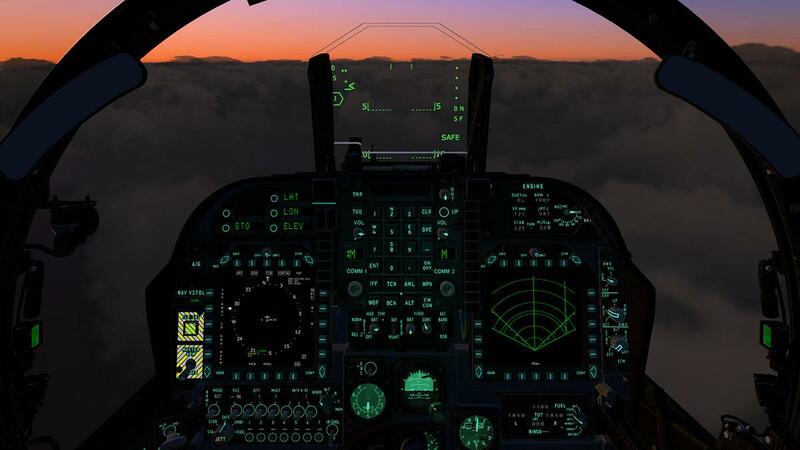 the GR1 aircraft was refuelled 11 times in flight to achieve the record. 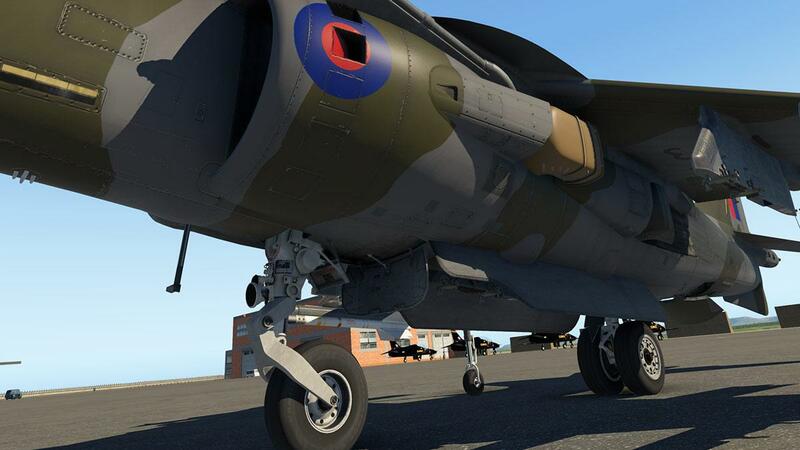 A great video of the event and the restoration of the aircraft XV471is here: Forces Network. 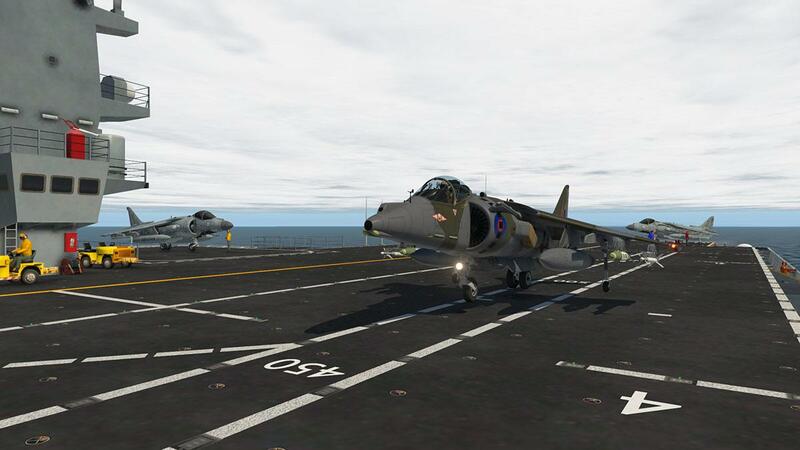 A variant for the UK Royal Navy (RN) was the Sea Harrier, but the aircraft was not capable of taking off with a full armament and fuel load from the ship's deck vertically, the solution was the Ski-Ramp that allowed the Harrier to achieve almost forward flight and with a big payload as well. 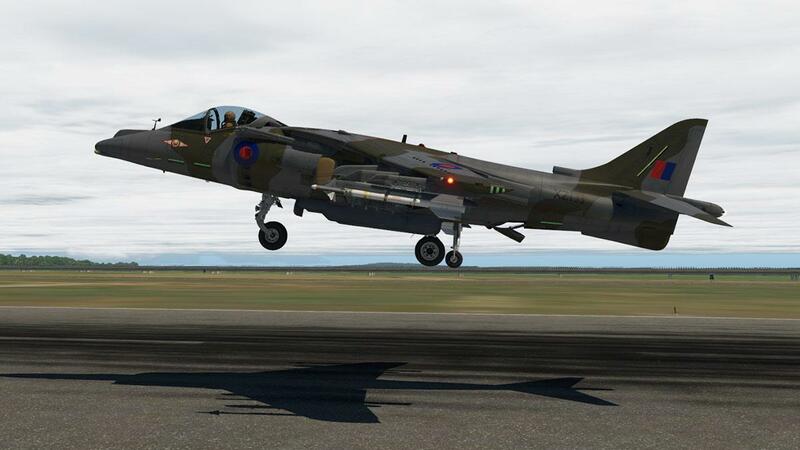 The flexibility of the Harrier led to a long-term heavy deployment in West Germany as a conventional deterrent and potential strike weapon against Soviet aggression; flown from camouflaged rough bases the aircraft's ability to just appear and disappear but still deliver a capable strike was very effective. 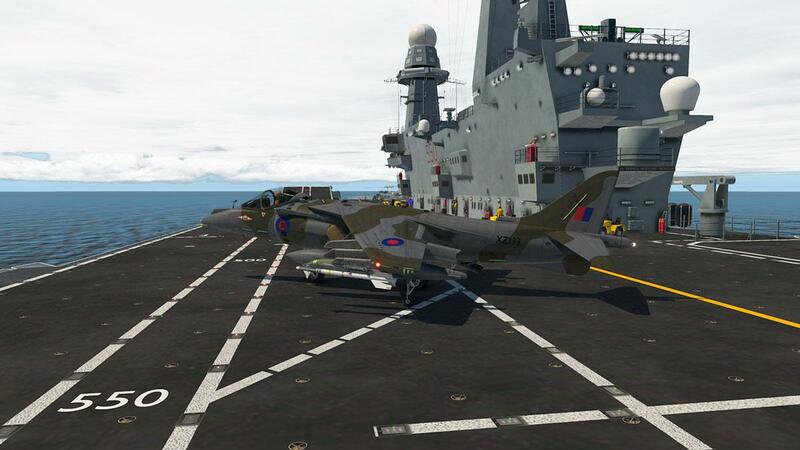 Every aircraft is known for a certain theatre of war, for the Harrier it was the Falklands War in 1982. 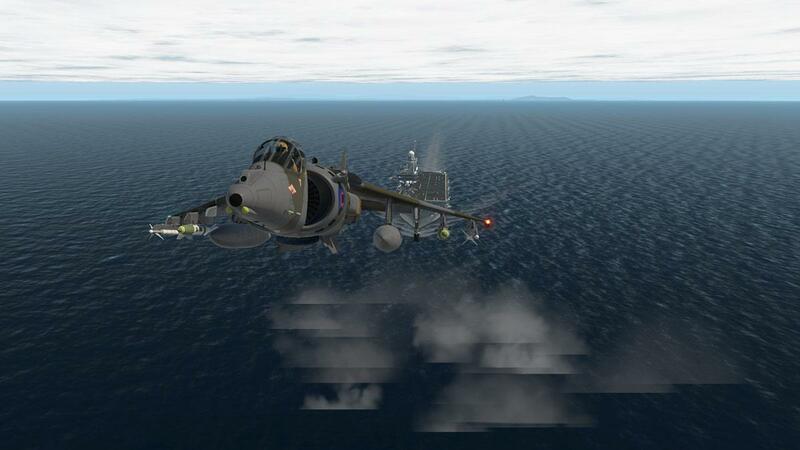 The South Atlantic distance of the conflict rendered the supersonic prime force to be almost grounded, until an airfield on the Islands could be secured, in fact the Harrier's exceptional low speed capablites were far more effective even against the Mirage lll than the usual theatre tactics with shoot over the horizon armaments, Both Sea Harriers FRS.1 and GR3's were both active in the war. 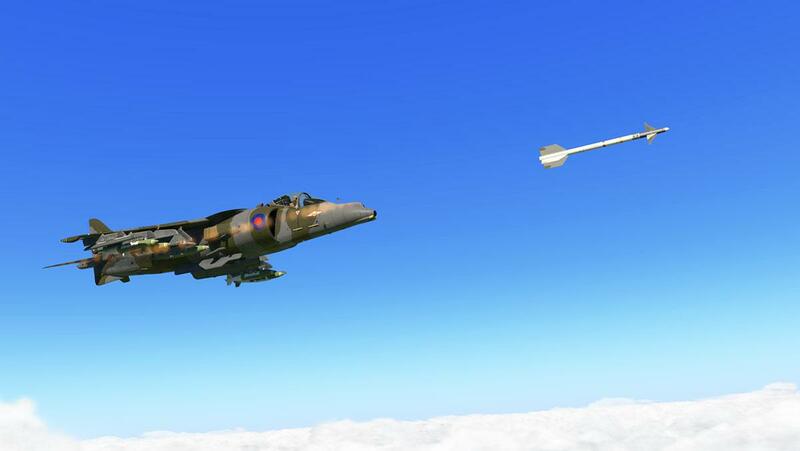 Further exercises trained pilots to use the vectoring-in-forward-flight (VIFF) capability to out-manoeuvre their opponents and showed that the Harriers could act as effective air-to-air fighters at close range and against far faster aircraft. 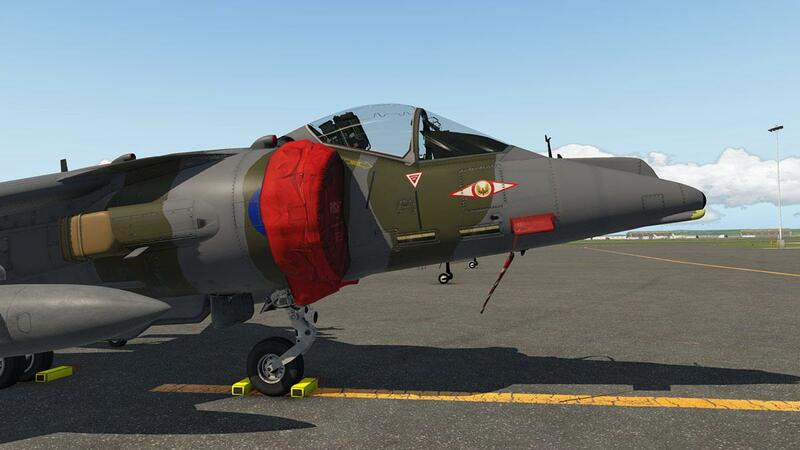 The AV-8A was really a duplicate of the RAF version GR1/3, but the U.S. Marine Corps wanted a bigger and faster version of the aircraft. 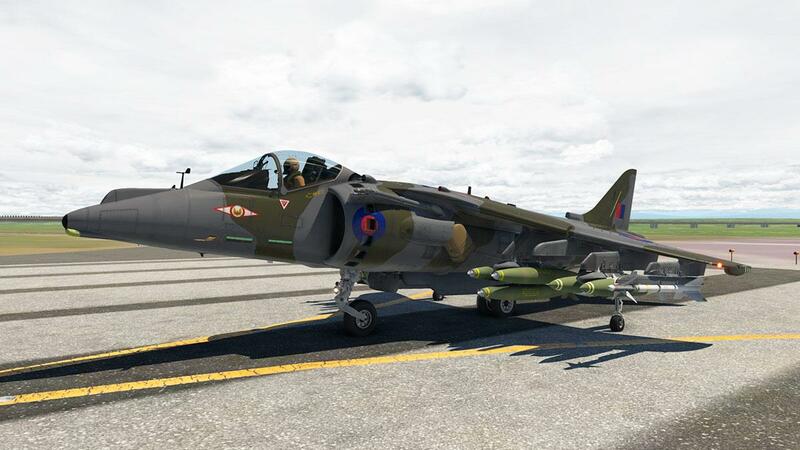 As the British government refused any more financial commitment, then McDonnell Douglas with an order of 12 originally then a full order of 324 aircraft decided to do the upgrade program themselves. 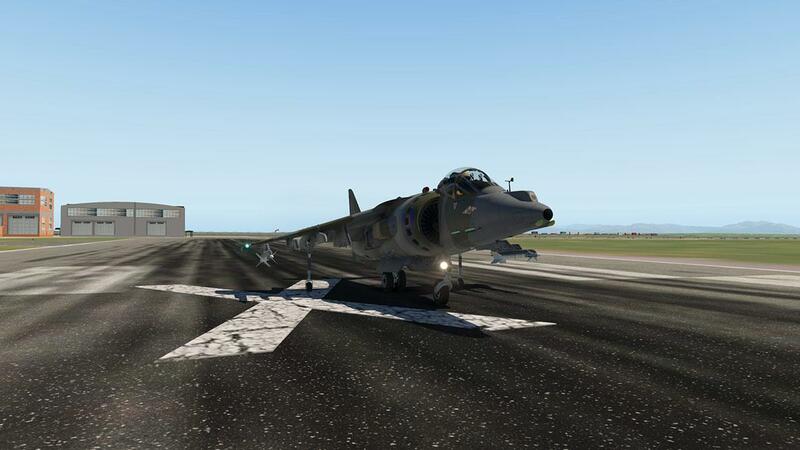 The new AV-8B Harrier ll had new wings, revised intakes, redesigned exhaust nozzles, and other aerodynamic changes with a supercritical wing, hands-on-throttle-and-stick (HOTAS) control principle, and increased engineered lateral stability make the aircraft fundamentally easier to fly. 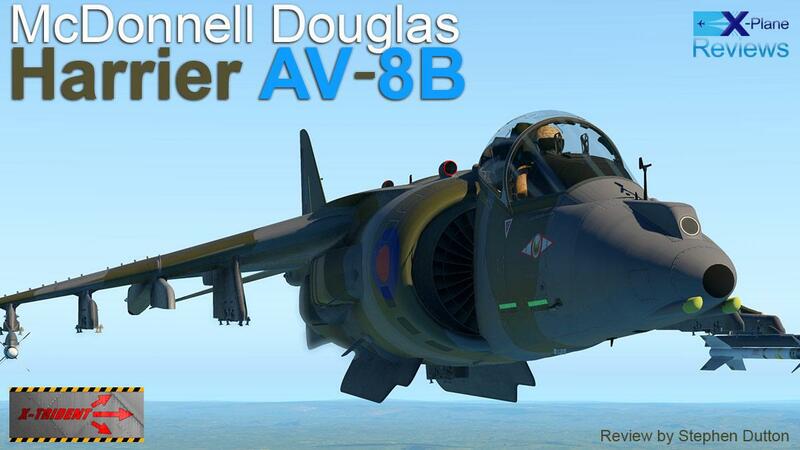 Hawker Siddeley or BAe Systems worked with McDonnell Douglas on the development of the Mk ll upgraded aircraft. The modified forward fuselage and cockpit found on all subsequent aircraft were not incorporated on these earlier prototypes which were designated YAV-8B, the first converted AV-8B aircraft flew on 9 November 1978, the British Government then reversed their original commitment to build the RAF version of the AV-8B with the GR5 which was the RAF's first second-generation Harrier. 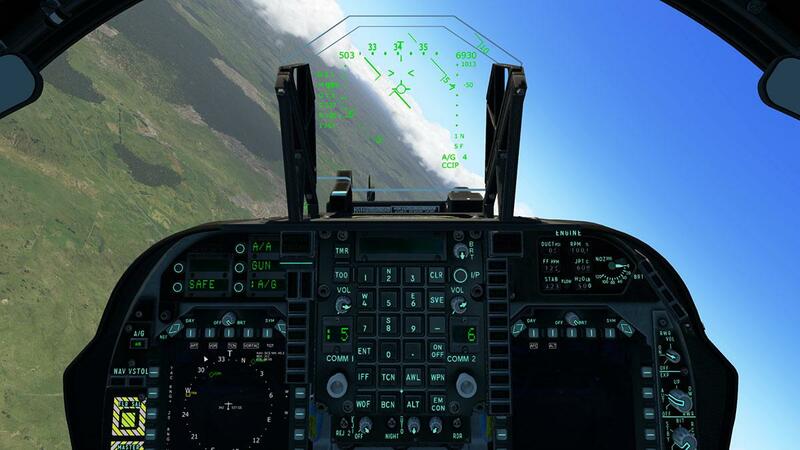 The GR5 differed from the USMC AV-8B in avionics fit, weapons and countermeasures, and forty one GR5s were built and saw action in Bosnia, Iraq, and Afghanistan. 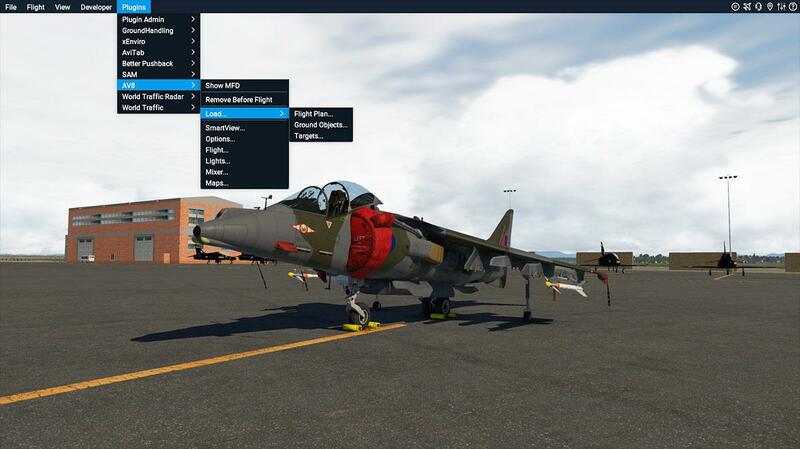 The Harrier was also flown by the Spanish Navy, Thai Navy, Royal Air Force, and U.S. Marine Corps. 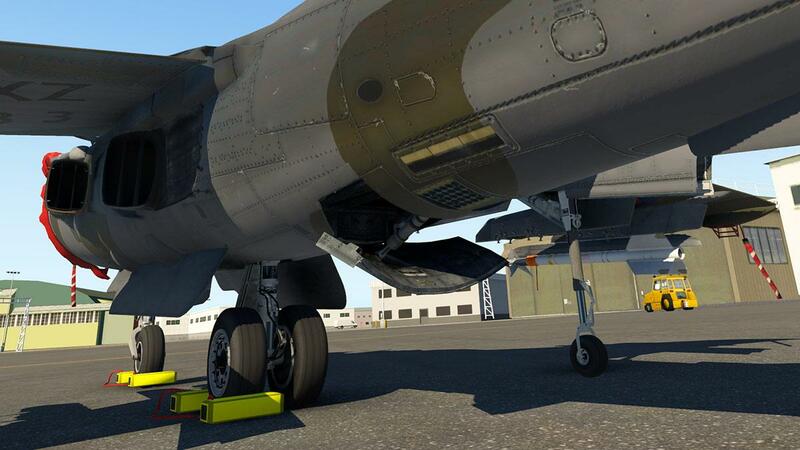 This aircraft for X-Plane11 was originally released late December 2018, but was noted as "still in development". 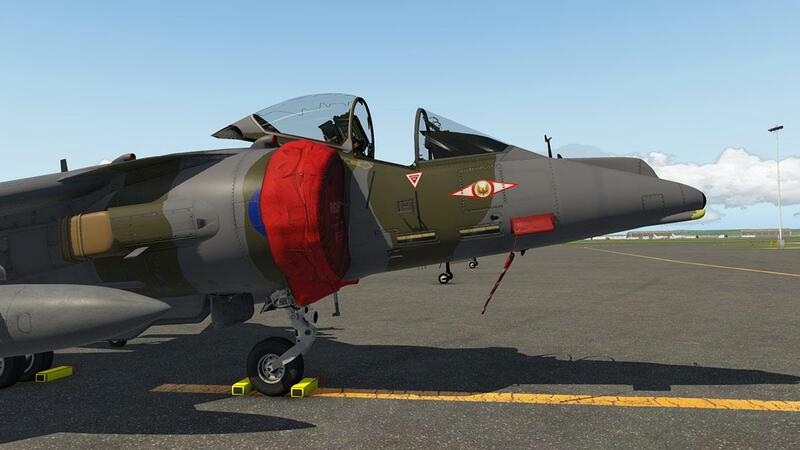 X-PlaneReviews obviously looked at the aircraft and development, and decided that it was all very nice but overall the aircraft still required some significant development to be noted as a release version. X-Trident noted that the development would be finished early in 2019. 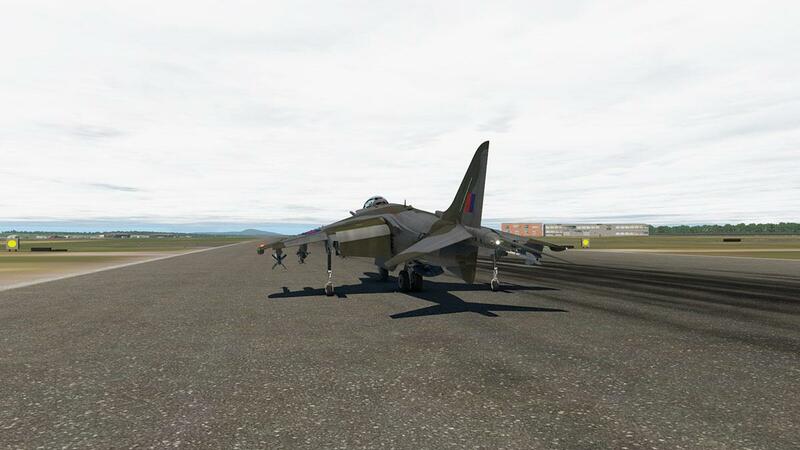 But the reality was (and we knew this) was that the 11.30 beta from X-Plane was going to take far longer than expected. Only by early March 2019 was the full complete release version was issued as v1.1 and is as reviewed here. 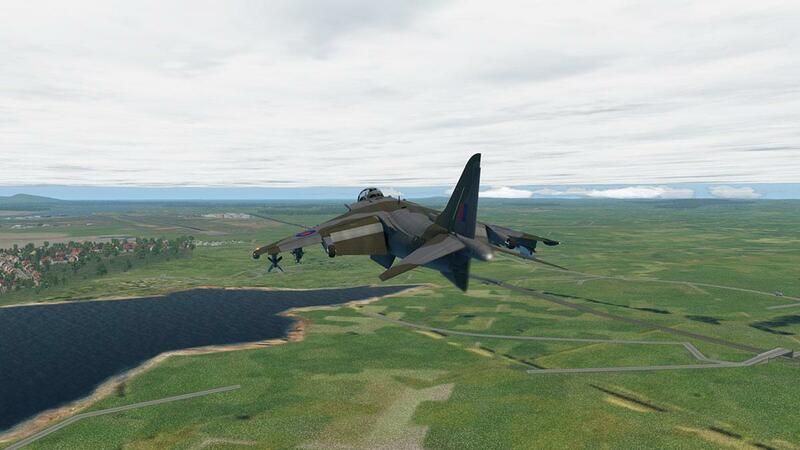 X-Trident are no stranger to military jets as their last project was the excellent aircraft Panavia Tornado GR4 of which X-PlaneReviews really liked. So much was expected here. 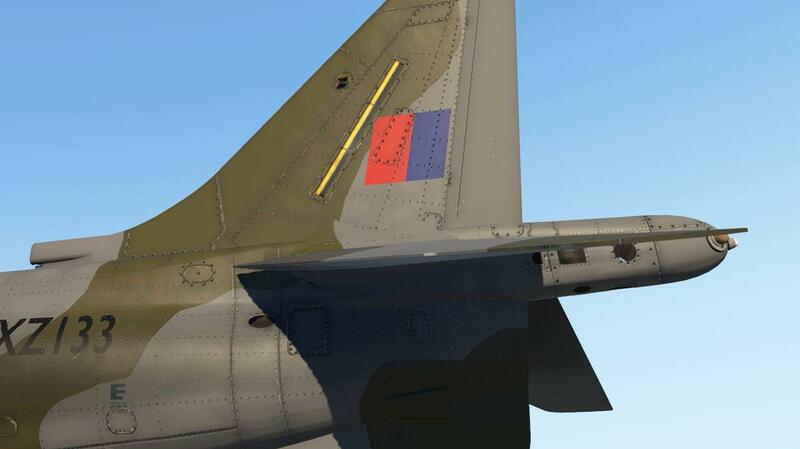 Note on the Pavavia Tornado GR4 in that X-Trident have also updated the aircraft to the current same 11.30 specifications (v3.0). 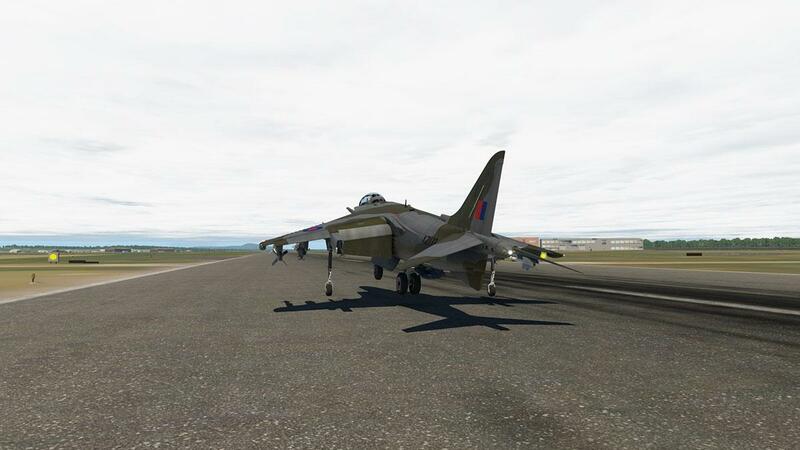 The Tornado was released over two and a half years ago, so the Harrier has had a long development process, X-Plane itself as a simulator has also had a few reincarnations since then as well. So you are really expecting a lot, and on a first view you are not certainly disappointed. I have lived with Harriers my whole life, from my childhood to their retirement in March 2011, the AV-8B is still however in US Marine service, but will soon be replaced by the F35. 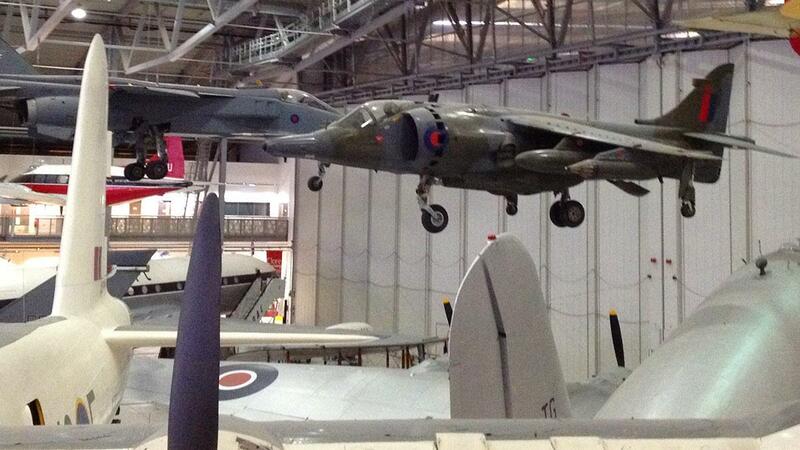 There are a few Harriers in Museums, I saw a few at Duxford UK, where it was quite hard to see into the aircraft (GR.3 XZ133) as it is suspended? 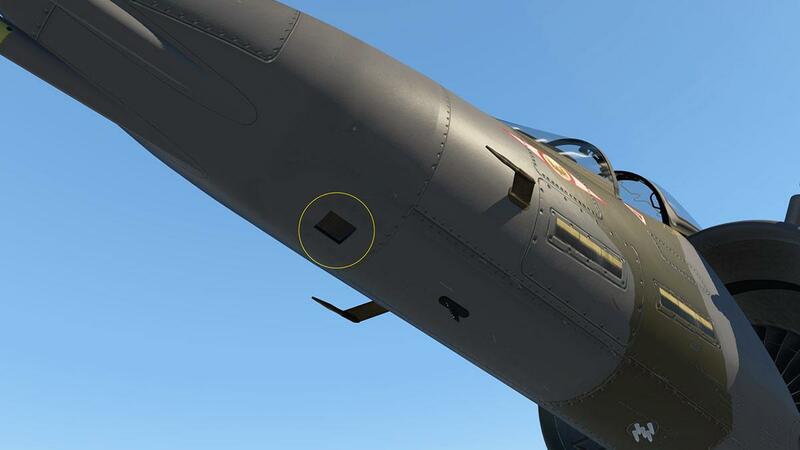 but the Pegasus engine is very accessible. 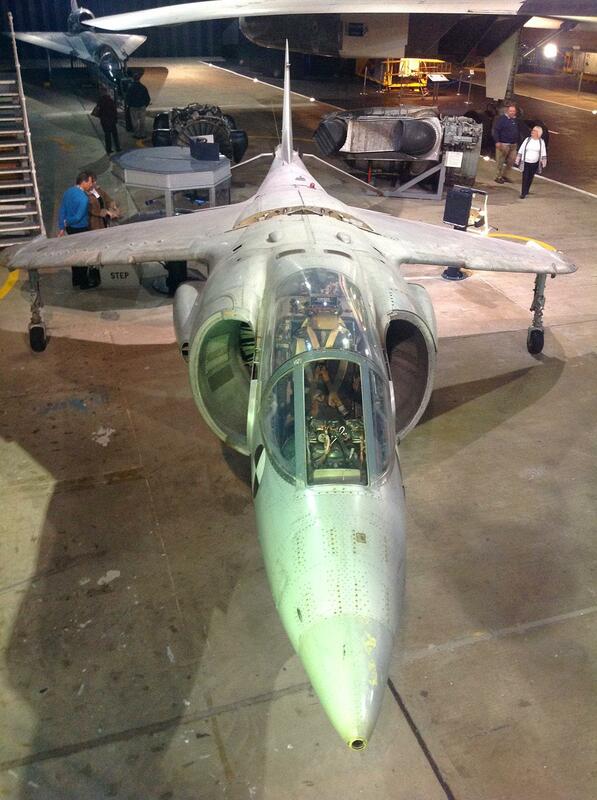 There is another GR.3 XZ997 at RAF Museum, Hendon. 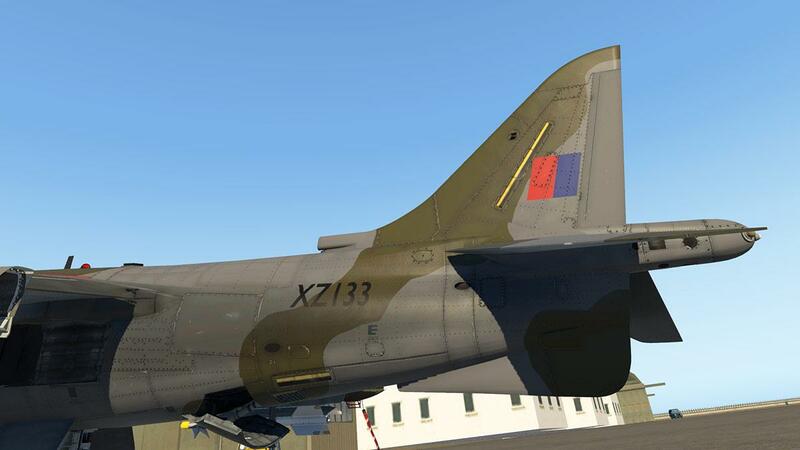 The Tribute XZ133 livery of the Duxford aircraft is used in this review. 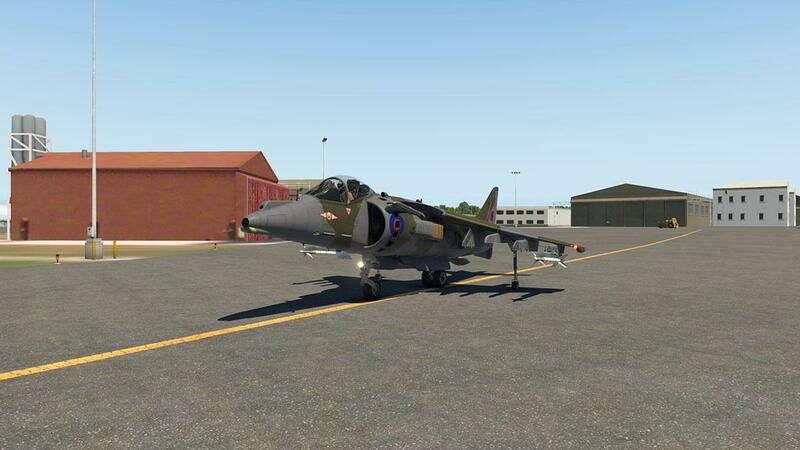 There is also a rare P.1127 XP980 (fitted with a Harrier GR.1 wing) which is on display at the Fleet Air Arm Museum, Yeovilton, England. 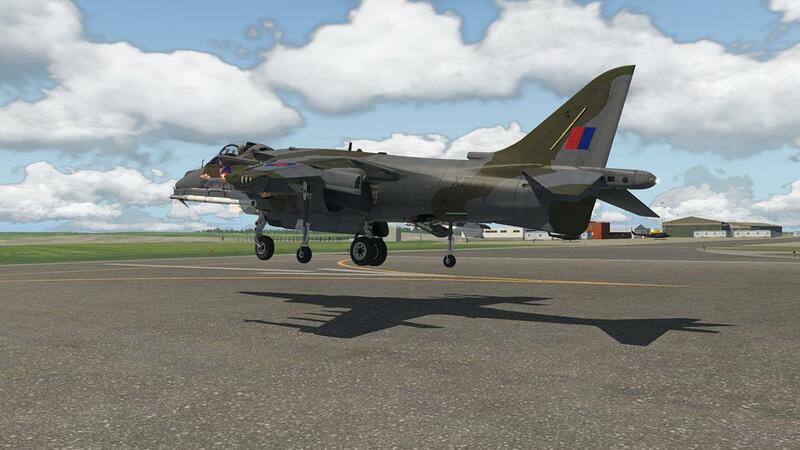 ... but the Harrier here does easily match the Hawk in most and even every area. 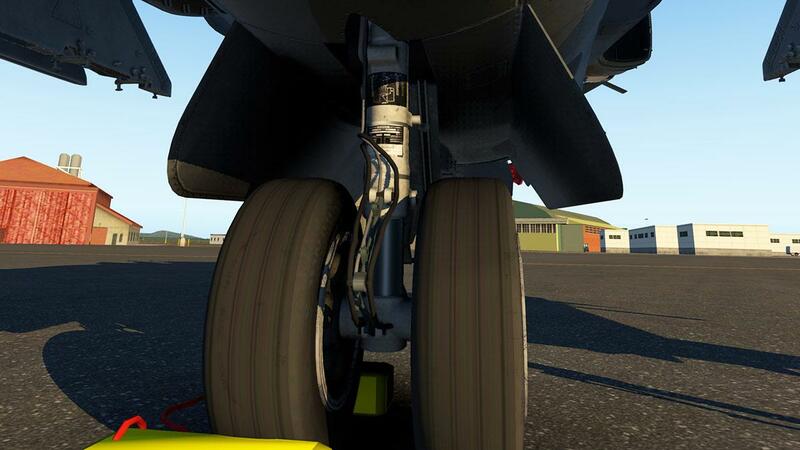 Undercarriage detail is excellent and all is highly animated, this factor is more important here as the aircraft is a vertical takeoff/landing machine, so the gear extension and retraction not in only in stowage, but the physical vertical movements has to be correct. Intimate detail is of course exceptional with lovely hydraulic cabling/piping and even the gear notices that are all perfect. 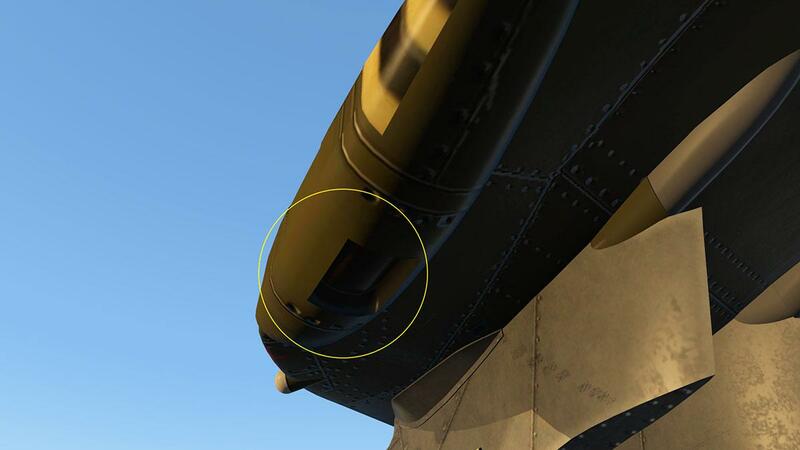 More highlights includes the weapon tracks, which are highly detail, and not just a texture image... under fuselage airbrake and so are the numerous of opening air vents that are required for the vertical flight. .... and these outlets control "Yaw". The development not of the thrust factor, but in controlling the nozzle aspect was the really big headache of the time (besides the early underpowered Pegesus engines), but once sorted the system created a landmark in aviation controllable flight. 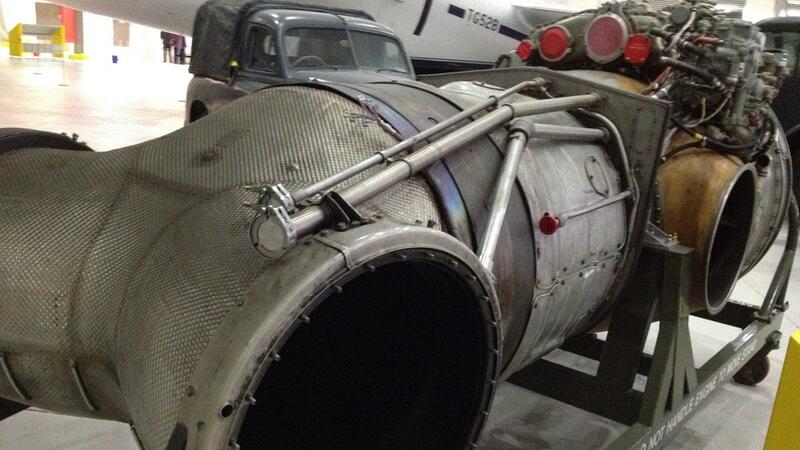 This is all powered by the later Rolls-Royce Pegasus F402-RR-408 (Mk 107) vectored-thrust turbofan at 23,500 lbf (105 kN). 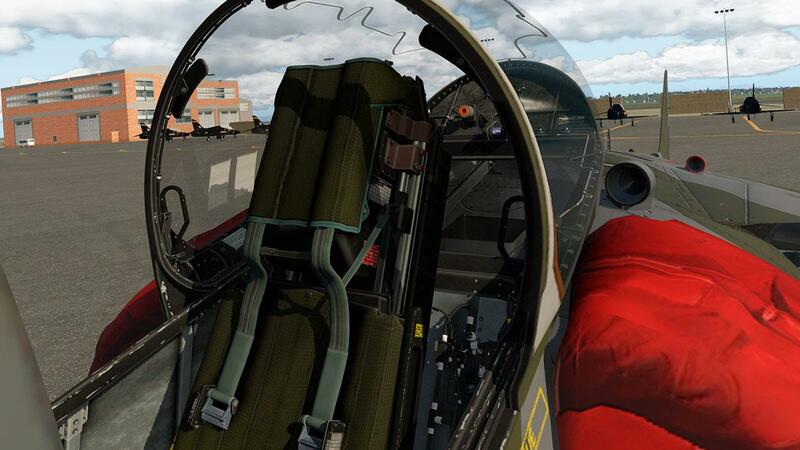 ... note the explosive trace for in flight ejection. 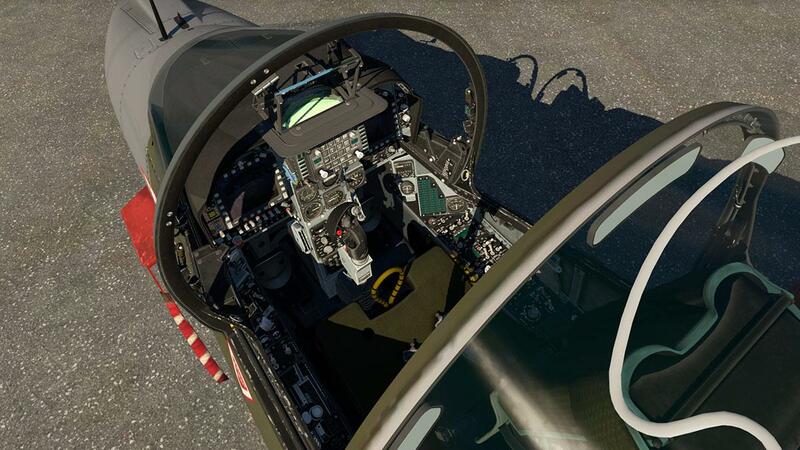 Cockpit looks extremely authentic, looking also at the Tornado it is also a few levels higher in detail and quality... certainly more work has gone into this design, and it is the most impressive work from X-Trident yet. 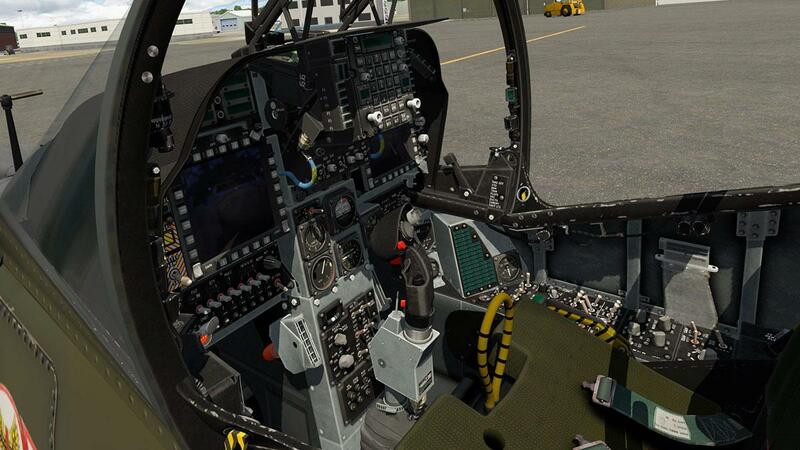 Sitting in the Harrier is a claustrophobic experience, that is mostly created by the extended UFC (Upfront Control Panel) upper-panel that contains the scratch pad display and keyboard, function selecting buttons and Radio Repeater controls. 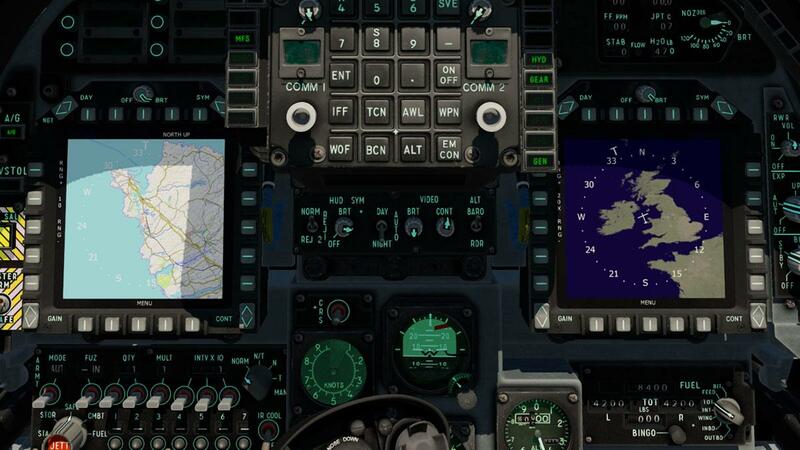 Either side of the UFC are two MFD's (Multi-Function Display) that we will get to in a moment. 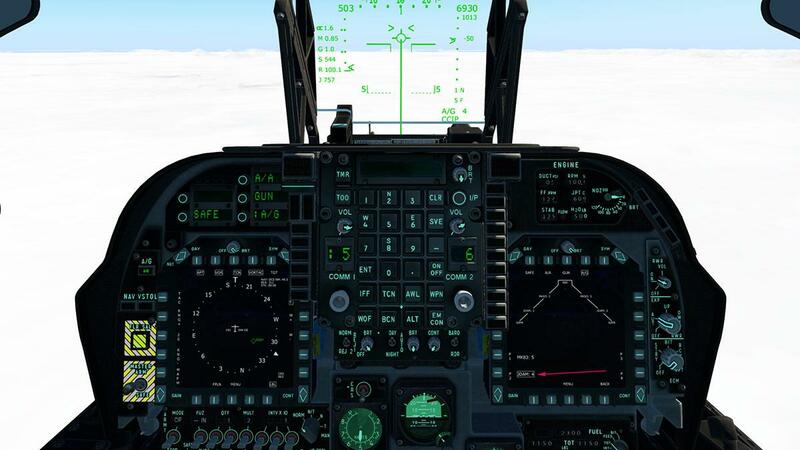 Centre is the front panel that is the analog backup (BU) instruments of Speed indicator, Artifical Horizon, AOA (Angle of Attack), Vertical Speed and sticking out the Altimeter. 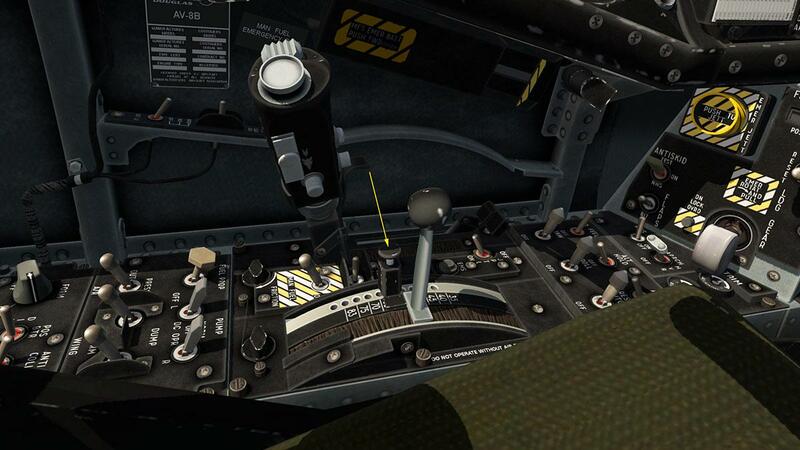 The lower BU instruments can't be seen as the joystick hides them, the stick is non-hideable as well. 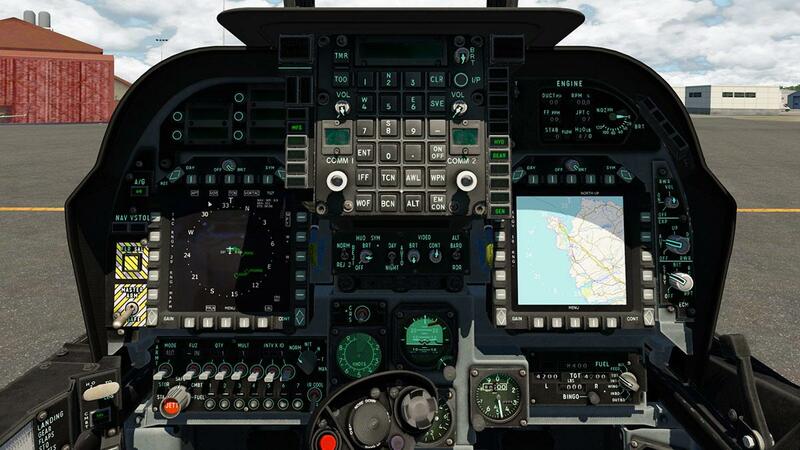 Top right are the engine readouts. Left top is the ODU (Option Display Unit), that works with the UFC. 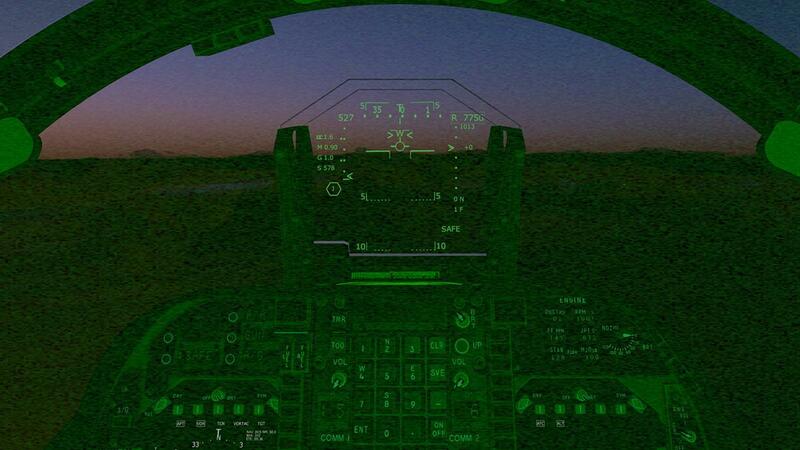 HUD (HeadUp Display) is top glareshield. 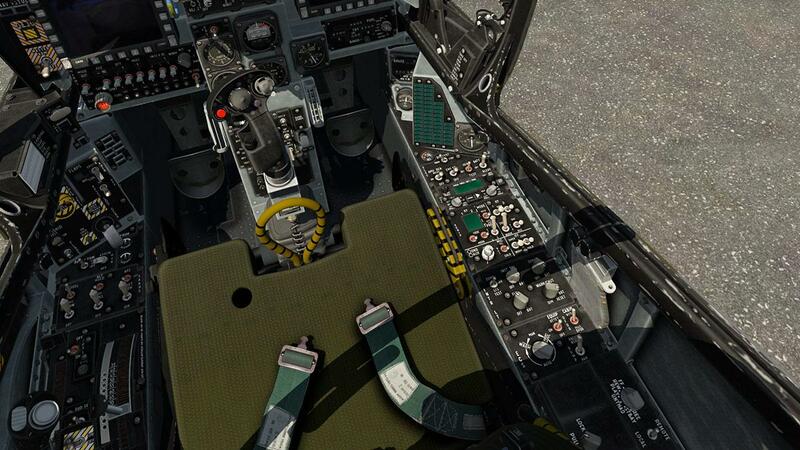 Also lower behind the joystick is the Auxiliary Controls panel that is not usually required in flight. an external stores "Selective Jettison". 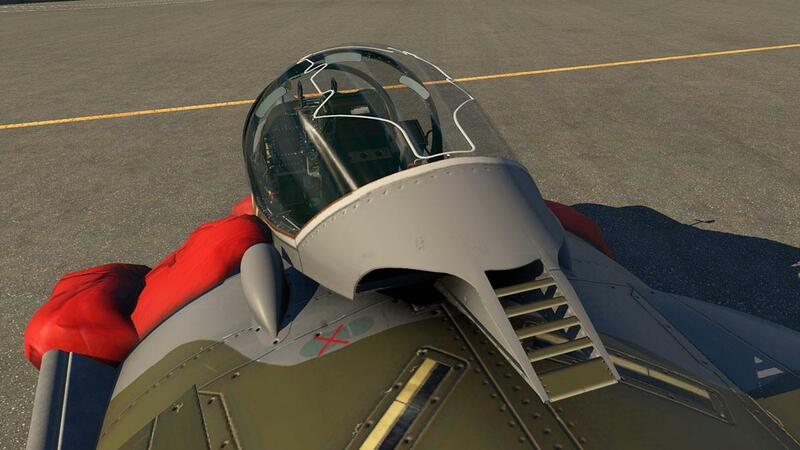 The Flap control is here as well on the side-front console, but the flaps are also part of the Stability Augmentation System (SAS) to transition to the hover mode, so you don't actually need to use the flaps in the Harrier manually as mostly as it is an automatic setting called "Aileron Droop". 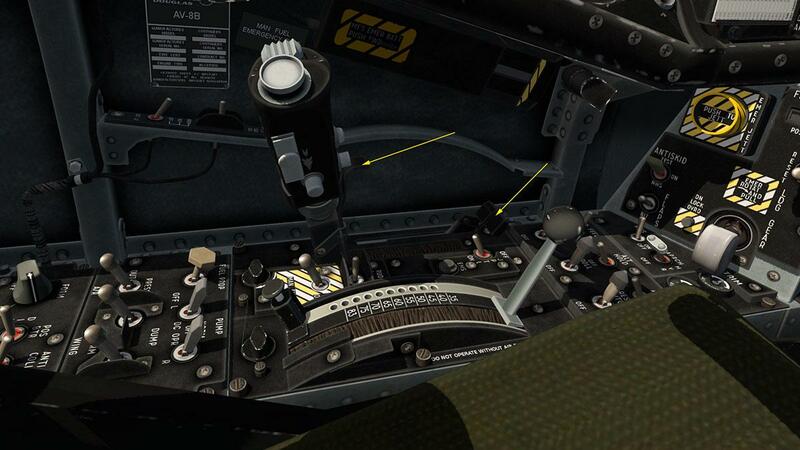 the Landing Gear Lever and anti-skid is located here as well. 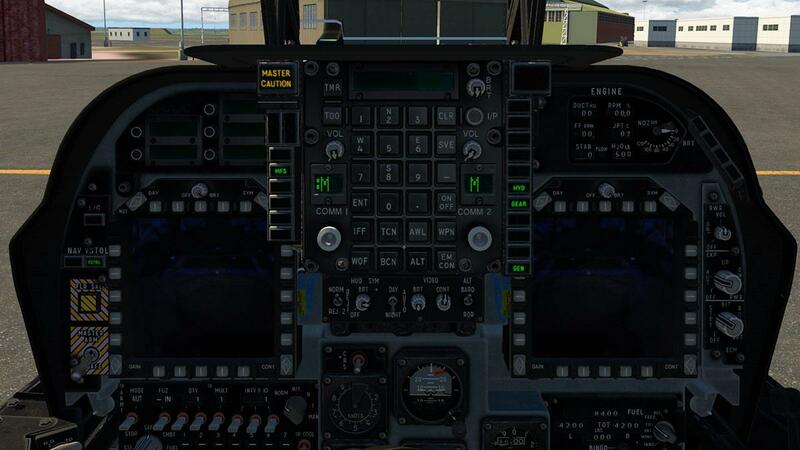 Right Lower panel is the Fuel Quantity Indicator with the Fuel transfer, in-flight Refuel and Fuel Dump which are controlled through the left rear side console Fuel Panel. Brake Pressure (excellent) and Accumilator are on the right side-front console. Canopy latch is above. Fuel Quantity Indicator has three displays that indicate the quantity of available fuel, other fuel selection choices include FEED, TOT (Total), INT (Internal), WING, INBD (Inboard) and OUTBD (Outboard). Full left side console is top to bottom is first the ELEC (Electrical Panel) including the APU start. VHF Radio is pure military. There are two radios which can independently be used in Manual mode, Pre-Set mode or Guard Mode. 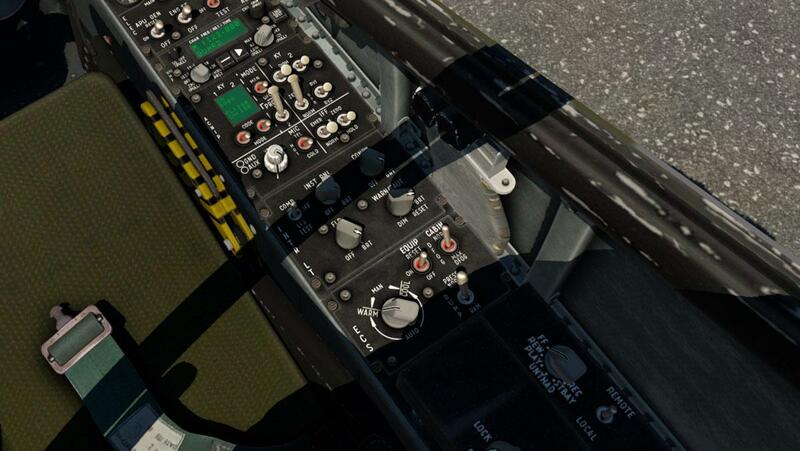 Radios are usually called COMM1 and COMM2 and are managed through the radio panel and UFC. 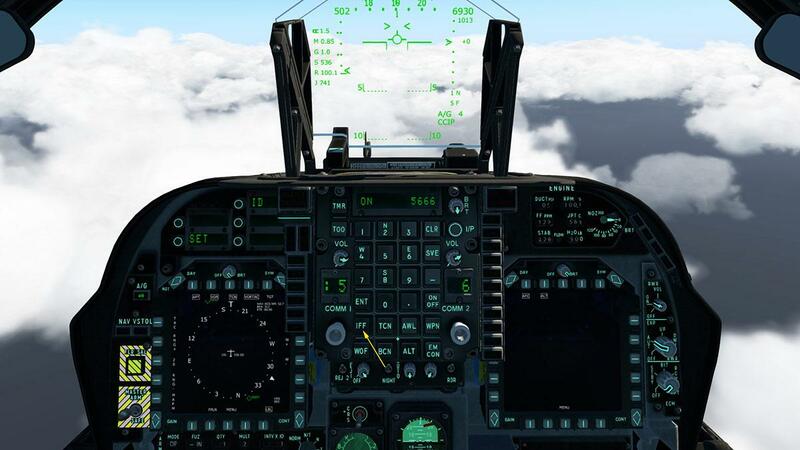 Set below the Radio is the ACNIP (Auxiliary communication, navigation, identification panel). 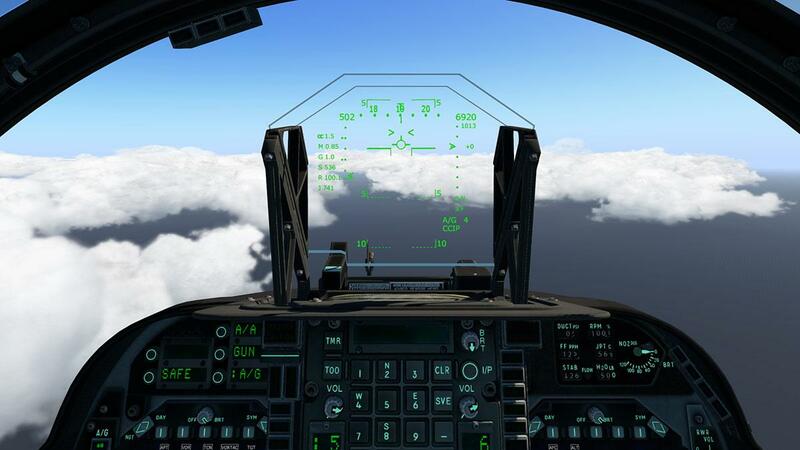 The ACNIP panel allows to monitor and control some navigation and communication functions. 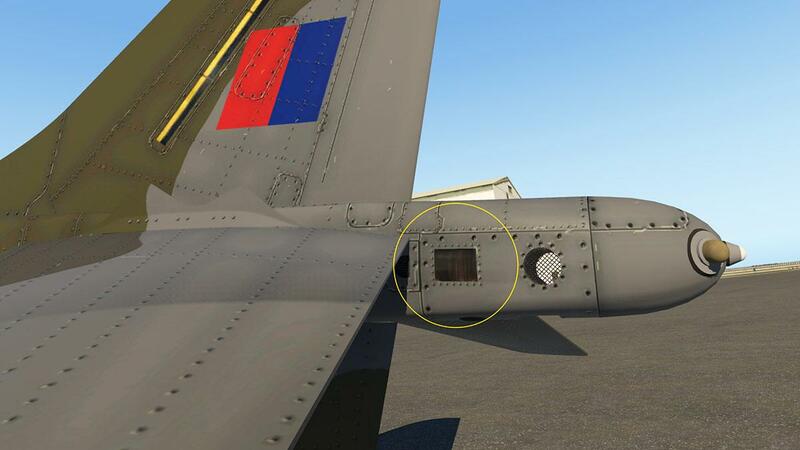 Included is the IFF status, Emergency Code, IFF ZERO, IDENT Squawk Ident and FL and CH display respectively the amount of Flares and Chaffs still available. 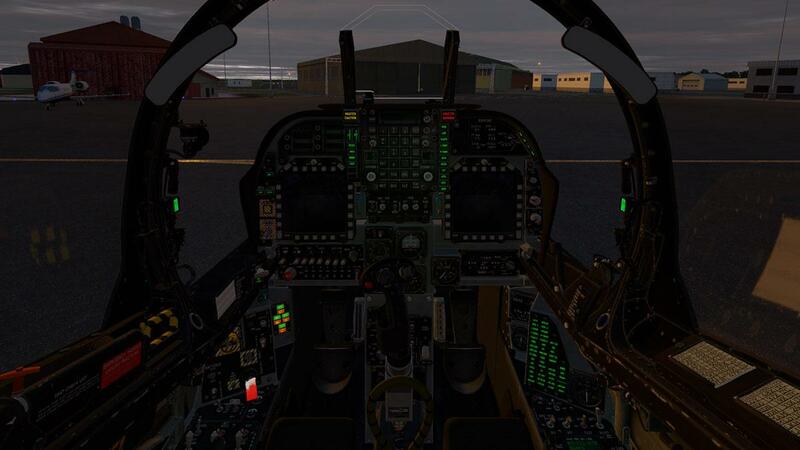 Rear right console is the INTR (Internal) Lighting, ECS (Cockpit Environmental Control System) on the rear wall (right of the ejector seat) is a nice isolation box, it doesn't actually work, but it is very nice detail. There are Warning, Caution and Advisory lights that illuminate to warn about a failure or a dangerous situation. Main panel is right lower and "WARNING" / "CAUTION" lights around the UFC panel. All are highly effective and come with the aural alerts that will make you simply jump out of your flying suit. Throttle is totally authentic with two gate locks, one is for the engine CUT-OFF lock and the other is for IDLE lock. 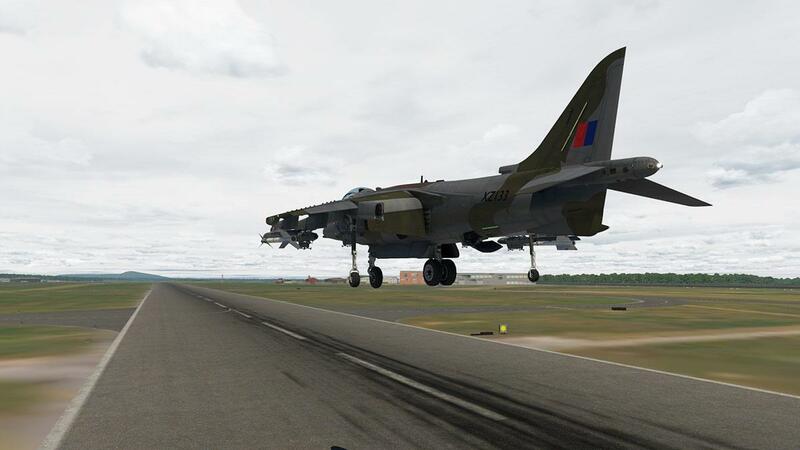 The Harrier has another control lever for Vectoring the Nozzles, the settings are 0º for full forward flight to 83º for full downward thrust, 100º can give you a slight rearward thrust. You can use a locking pin to set the full 83º or any other degree positions to protect you from changing the angle to the wrong degree position, and it works extremely well in an eyes forward situation. 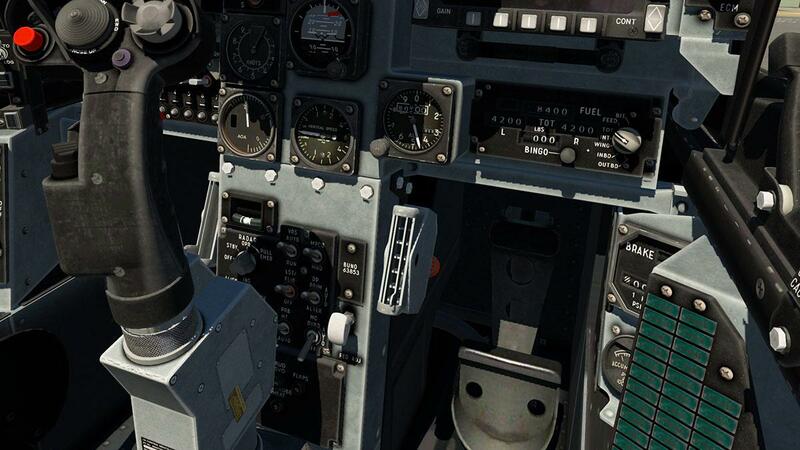 One area I had issues with on the pre-release of the X-Trident Harrier was using my Saitek X-56 throttle twin throttle as both the main throttle (left lever) and the Vectoring lever (right lever), as there was no actual X-Plane setting you could use for the vectoring? 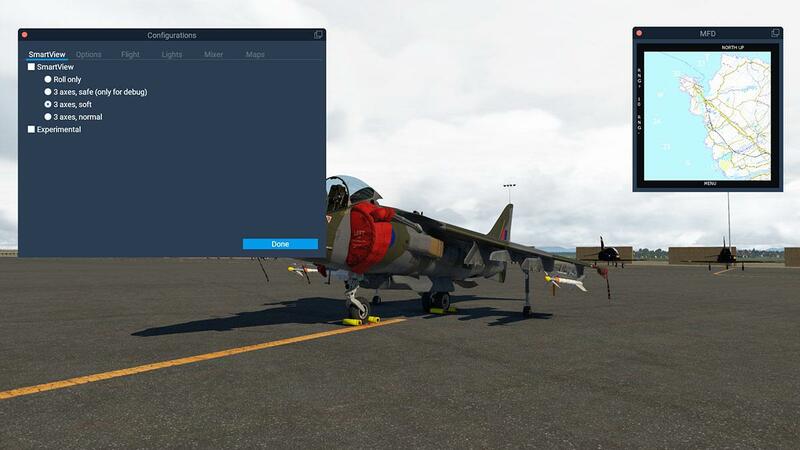 That is changed in the v1.1 release version with the use of the X-Plane command "Thrust Vector" and it now works perfectly. You can of course still use the key commands "Vector or Sweep Aft" and "Vector or Sweep forward" to move the vector lever forwards or backwards. There are two MFD's (Multi-Function Display). and both can be set for a certain display function. 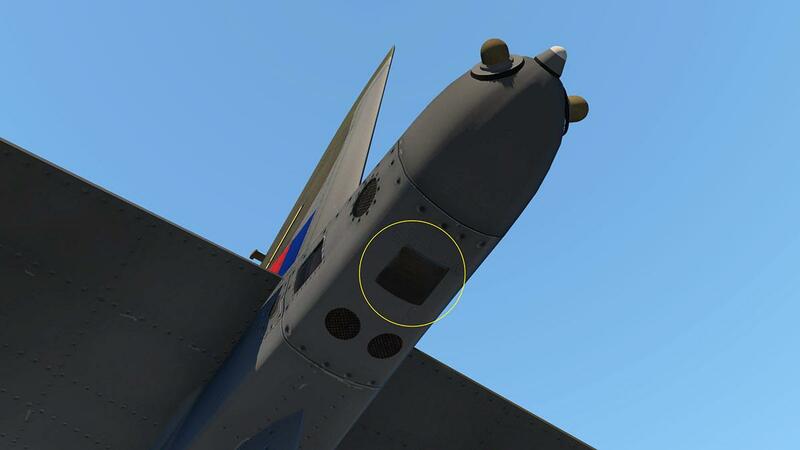 There is a pop-out window, but only one, so you can't have both MFD's popped out at the same time... which is odd and no help for self made cockpit users. Pressing MENU on either screen will bring up the main menu. 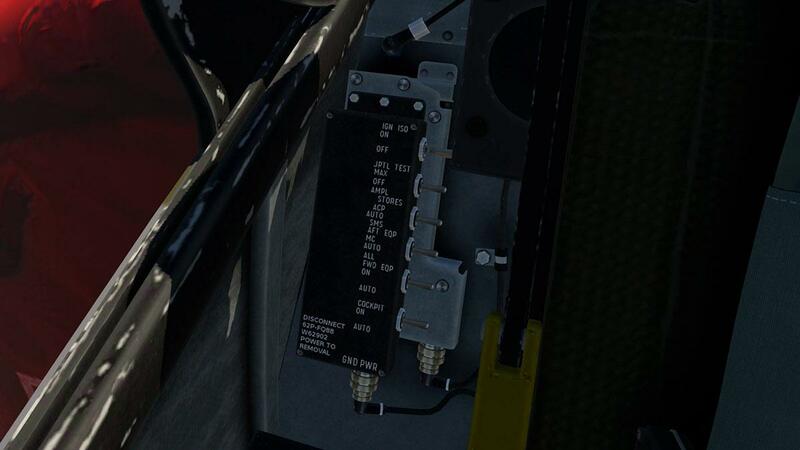 The commands are set across the top for the main types of screens and aircraft commands are on the bottom. 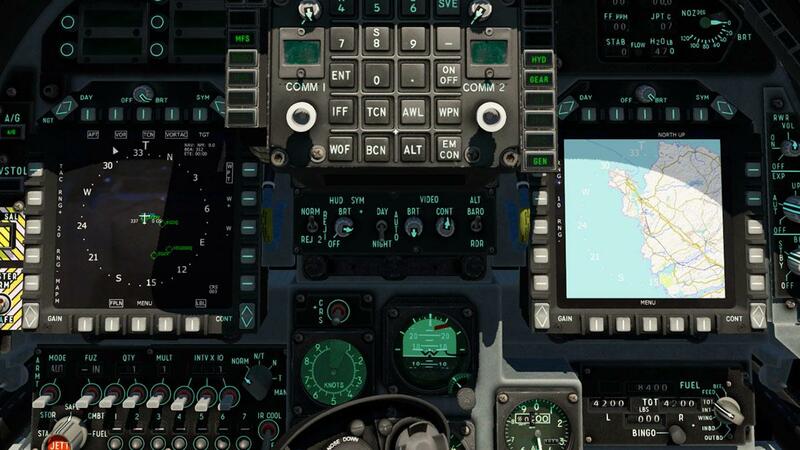 Top row commands are MAP, NAV, TMR, FLIR and WORLD, lower commands are COMMANDS, EMER and MISSION. 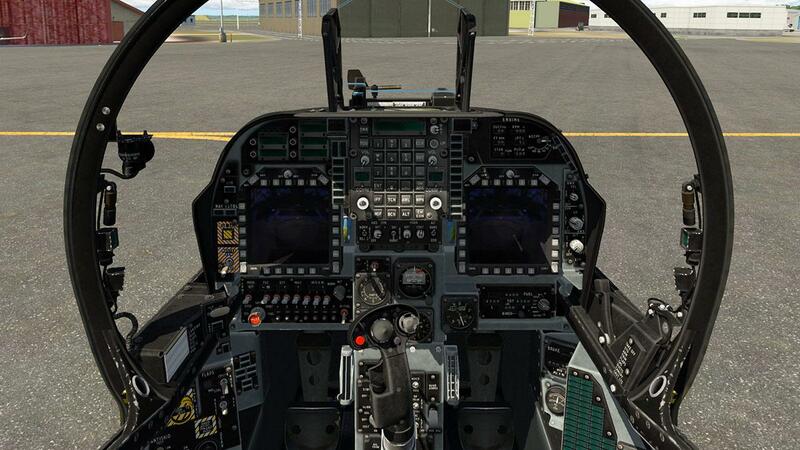 My main flight/mission setup is the NAV on the right and the MAP on the left. 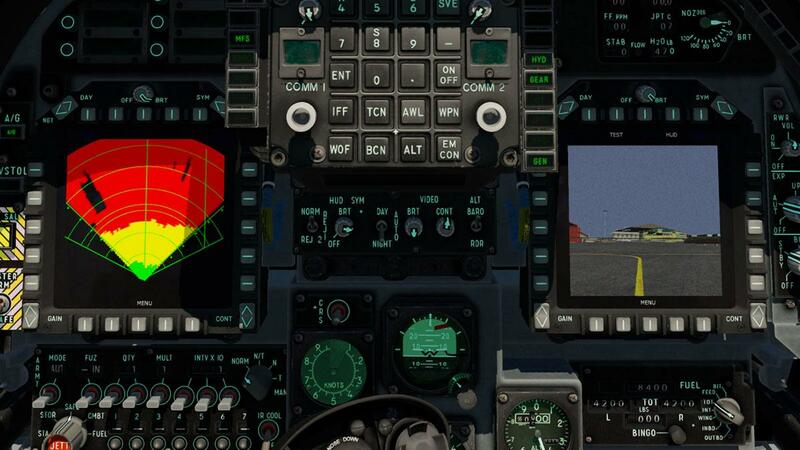 TMR (left-right image)) is the "Terrain Mapping Radar" which generates a synthetic image of the ground in front of the Aircraft; Radar antenna is tilted 0.15° down to display also obstacles slightly below the flight level. NAV selections include: APT, VOR, TCN, VORTAC and TGT (Target) of which you can set by putting in an "Ground Objects" of which you can set three targets. 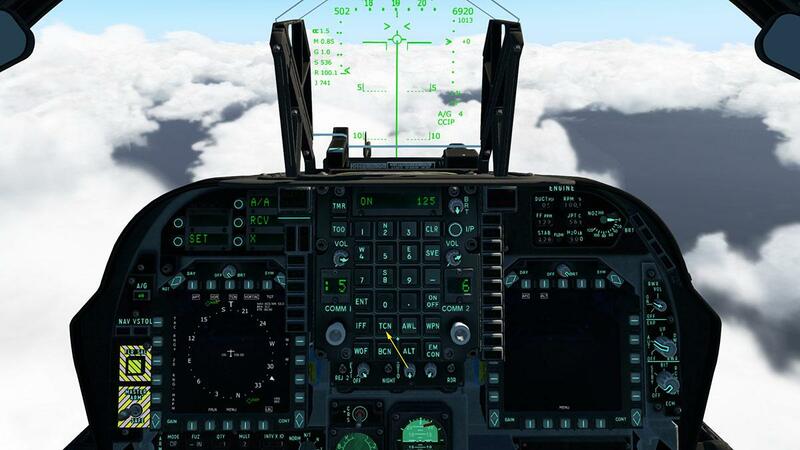 FLIR - FLIR camera returns a synthetic image generated by Infrared Camera, and the HUD symbology can be superimposed by selecting the HUD option. 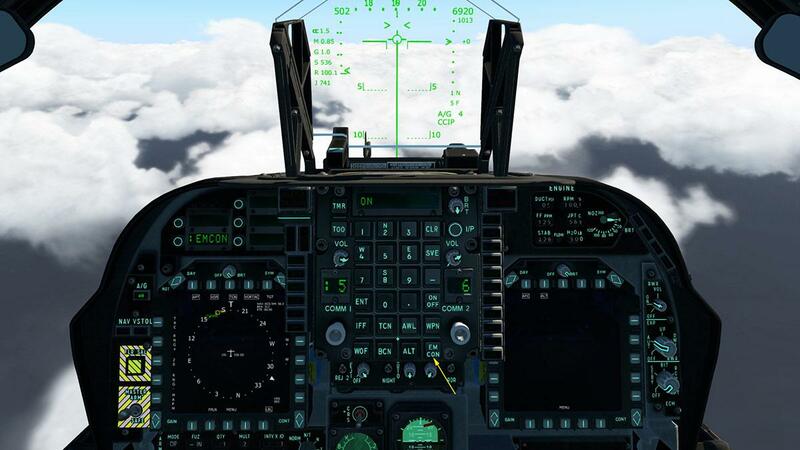 With the NAV on the right MFD then the FLIR with HUD option on, it is a very effective heads down flying situation. Using both MAPS and WORLD you get two perspectives of your position in local and global positions. You can insert your own mapping images in an "MAP_FOLDER" but you are also required to set out the map format (syntax) so it is animated in the MFD, image sizes are 4098x2632 px. 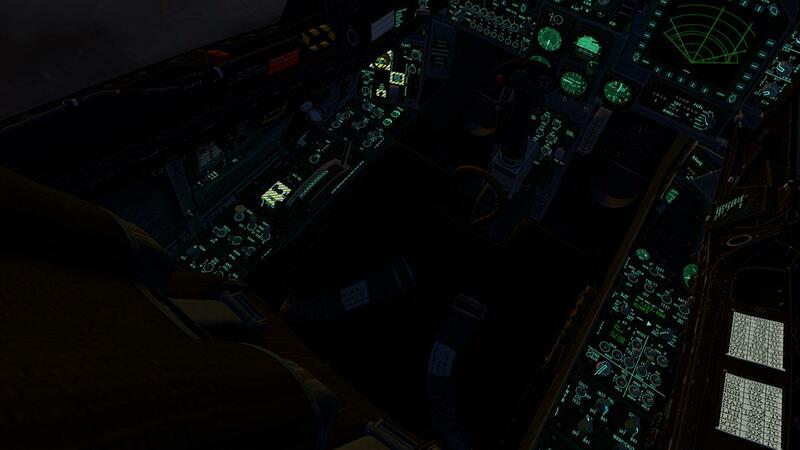 ... again an easier heads up solution to switching on/off the autopilot, and I used it all the time as the switches left lower console are hard to see, never mind use when the throttle/vector lever is forward. 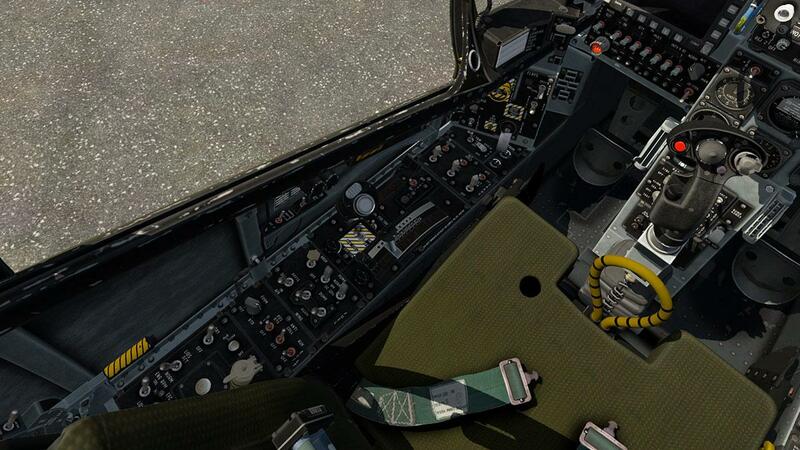 MISSION has two settings in "WEAPONS" and "TARGETS"
Selecting WEAPONS gives you the current armament/fuel load on the aircraft, you can then select the weapon of your choice or SAFE the weapons. 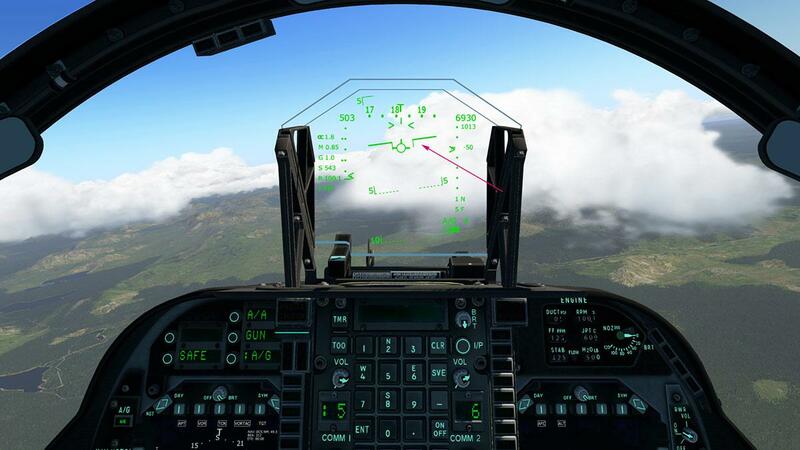 TARGETS allows you to select the target you require, and the ones that you have set up with the static objects. 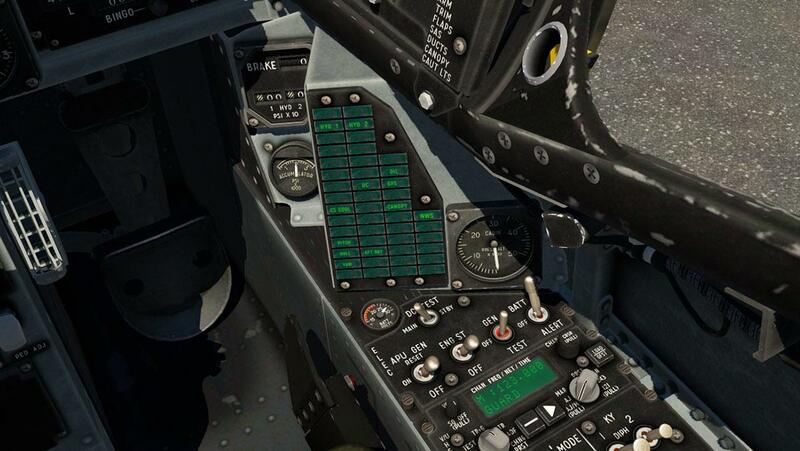 The AV-8B menu is located in the "Plugins Menu" on the X-Plane banner menu. The menu is in four selections: Show MFD (pop-up), Remove Before Flight (Static Elements), Load (Flight Plan, Ground Objects and Targets) and the Configurations panel. 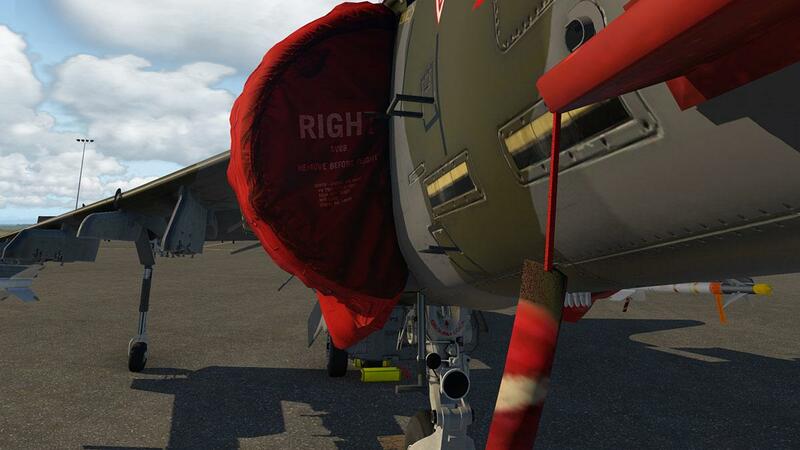 Remove Before Flight (Static Elements) has engine inlet covers (excellent! 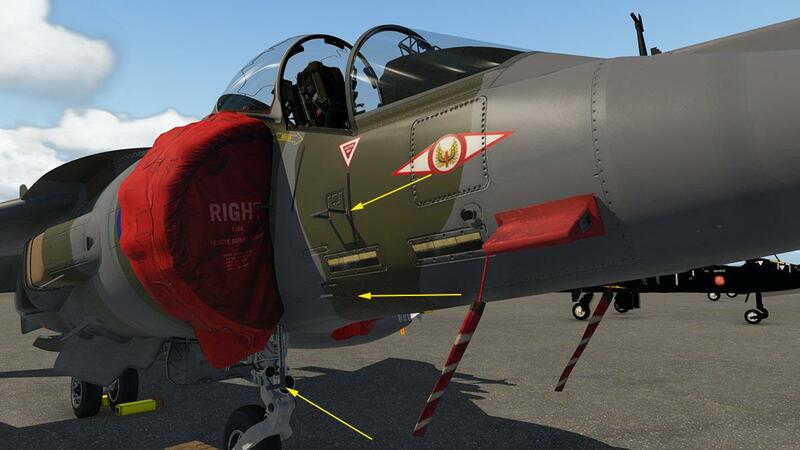 ), wheel chocks, pitot covers, refueling probe cover, pilot hide, tags and weapon "safe" tags... all are excellent, but you can only use them all or nothing? I always like the option of using just wheel chocks and safe tags without the full monty of everything, so the static elements are a bit limited in their use. 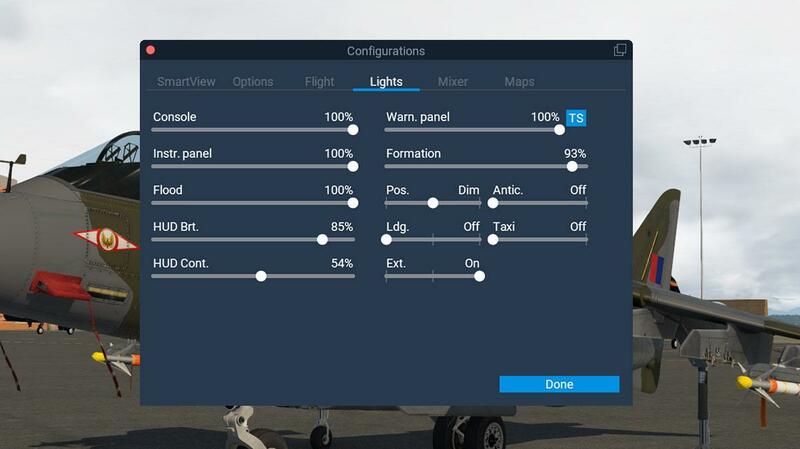 The "Configurations" Panel has six selections with: SmartView, Options, Flight, Lights, Mixer (Sound) and Maps. 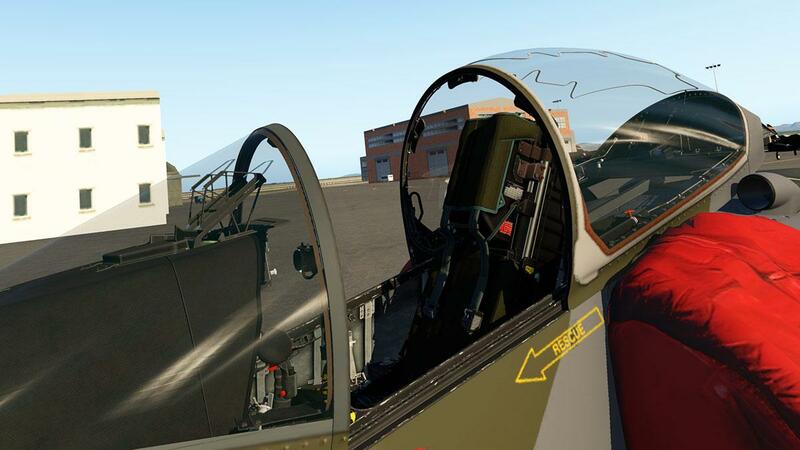 Configurations/SmartView: Smart View is an X-Trident option which controls the POV (Point of View) on all axis to recreate the movements of the pilot’s head and gaze when maneuvering. 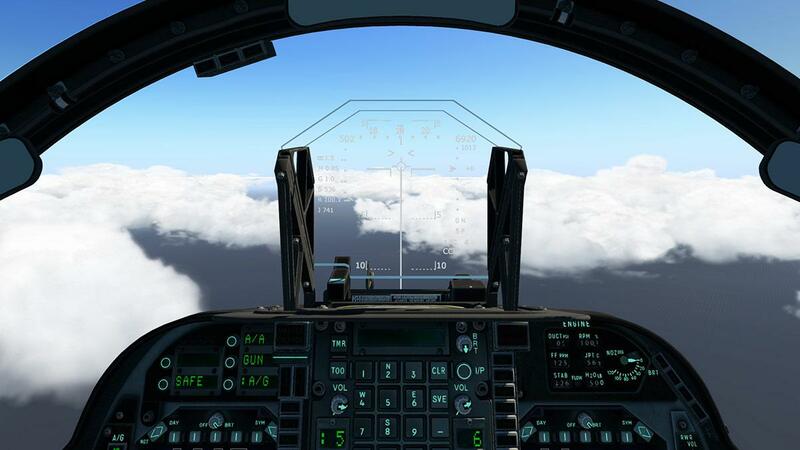 When Smart View is active, cockpit view is no longer controllable by mouse or buttons. 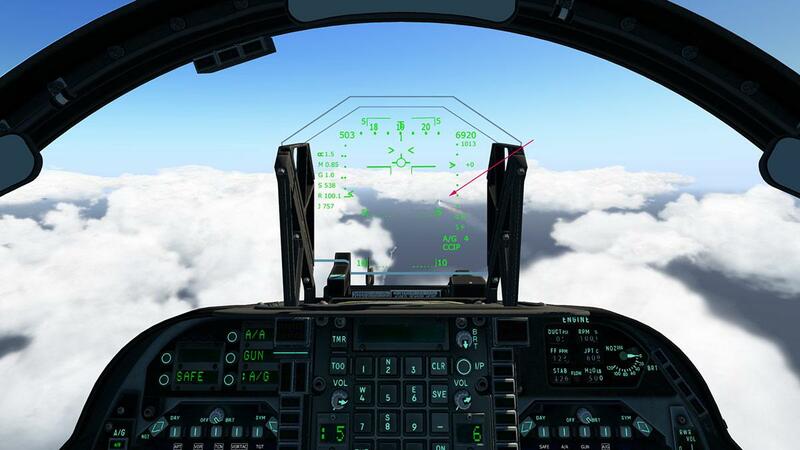 VRHUD - Focuses HUD to infinite, option can be left on also without VR. Custom Carrier - A custom “NAVE CAVOUR” carrier is supplied with the package (we will look at the carrier later). 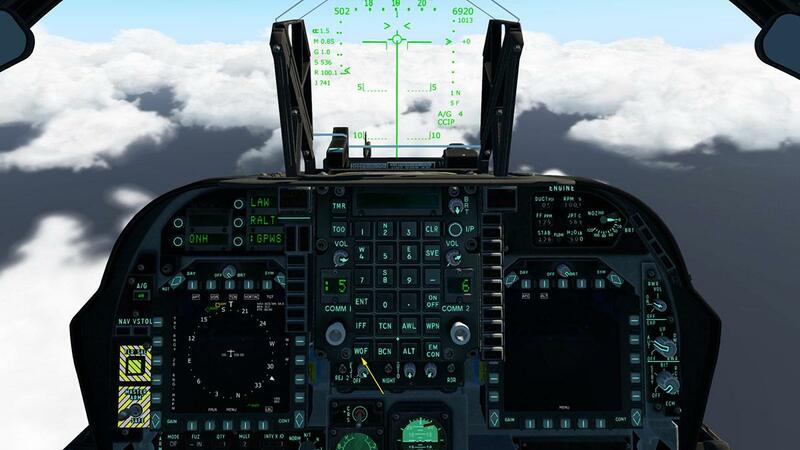 Nonlinear throttle - Activates a “nonlinear” throttle response, as in real AV-8, in order to have an accurate control of RPM and Thrust above 85% RPM. Flight options include a few selections that are also selectable in other areas. 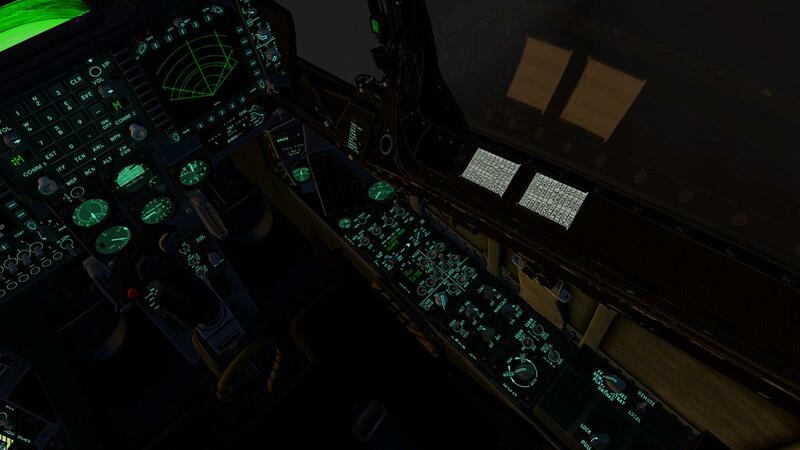 Sets the lighting settings in internal selections: Console, Inst.Panel, Flood, Warn (Warning), HUD (Brightness) HUD (Contrast). External Selctions: Formation, Pos. (Position), Antic (Anticollision), Ldg. 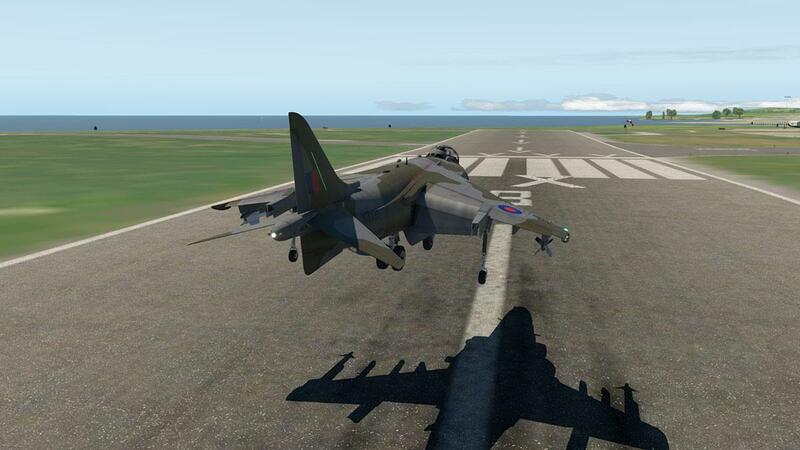 (landing), Taxi, Ext (Navigation). Shows and allows selection of Maps available for display in the MFD. 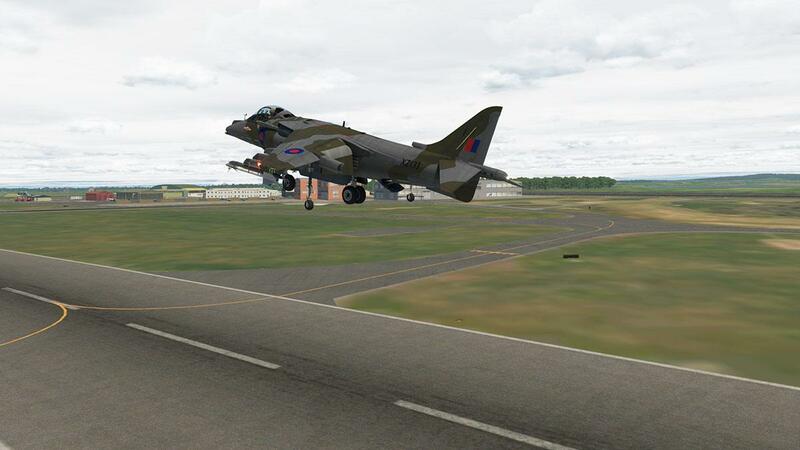 In most circumstances taking off in an aircraft from an airport is to taxi to a runway and takeoff... but the Harrier is no normal aircraft, as It gives you choices with V/STOL capability. 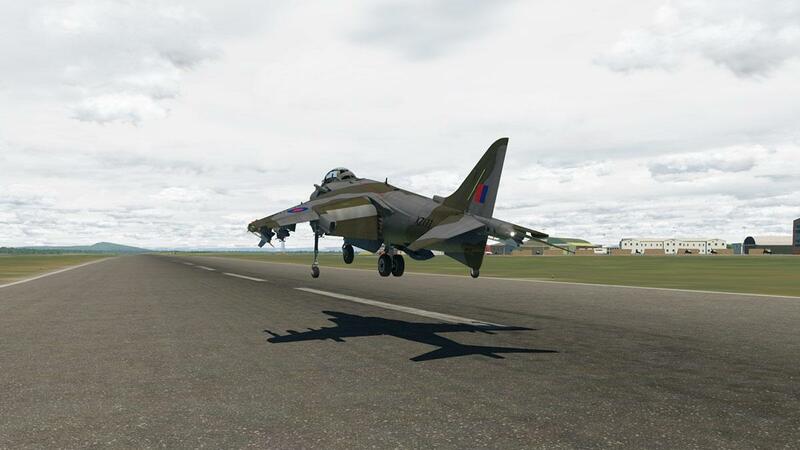 But also restrictions as you can't takeoff vertically unless the aircraft is quite light, a few sidewinders and a low fuel requirement is the the only go... the VTOL selection in the Flight/Menu will do that for you. When you taxi you can go to any point on the runway and not the usual start, or really anywhere you have a wide flat hard space, and yes you could even use a heli pad, but your skill level would have to be quite high. The vector setting is noted at 83º, but it is more sensitive than that, as the line between going forwards, backwards or into the straight up hover is very fine... you don't have to look down at the nozzle lever as there is a nozzle angle guide on the left of the top of the instrument panel (it is noted in the HUD as well), mostly you use only two settings in 83º and 50º for runway takeoffs. 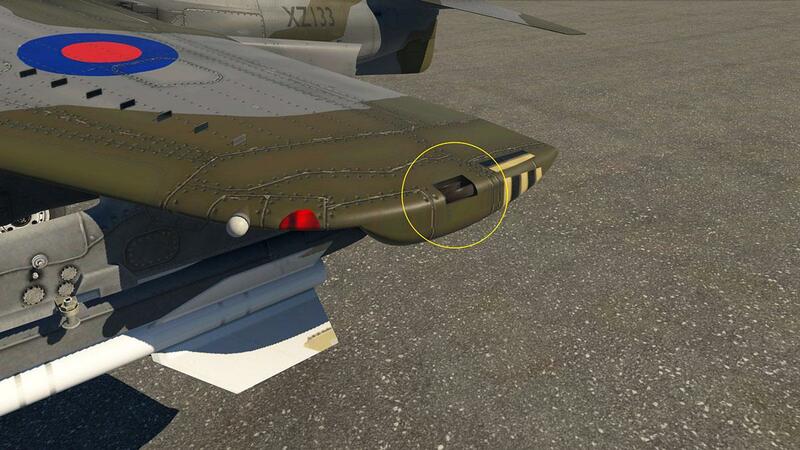 ... one way to gauge the thrust direction correctly is by the blast dust. 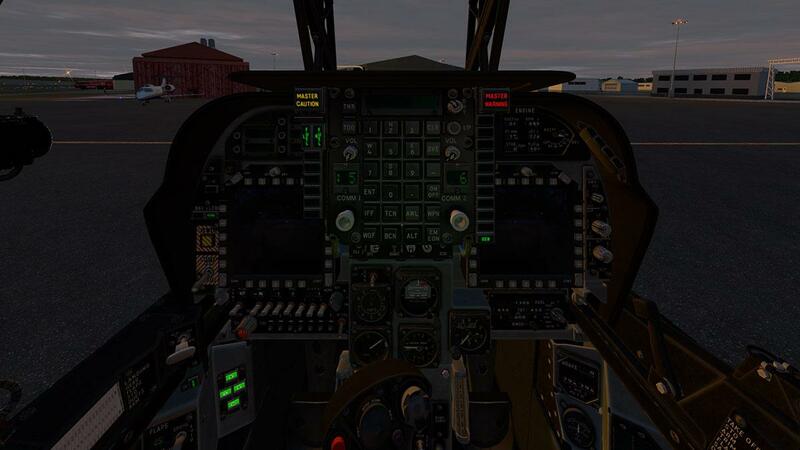 The X-Plane11.30 particle effects are excellent here as you can see the direction of the thrust by the dust, it is easy to see the rearward or forward thrust directions, and there is also a sweet spot in the middle. ... returning to the field and the transition from aerodynamic flight back to hover flight is not as hard as you think it is, and slowing down is quite easy with those huge barn door flaps doing all the work for you. The hard point is later when you feel the transfer of the heavy aircraft weight back onto the downward air thrust, helicopters have of course the same sort of weight transfer, but it is far more evident here, even excessively so. 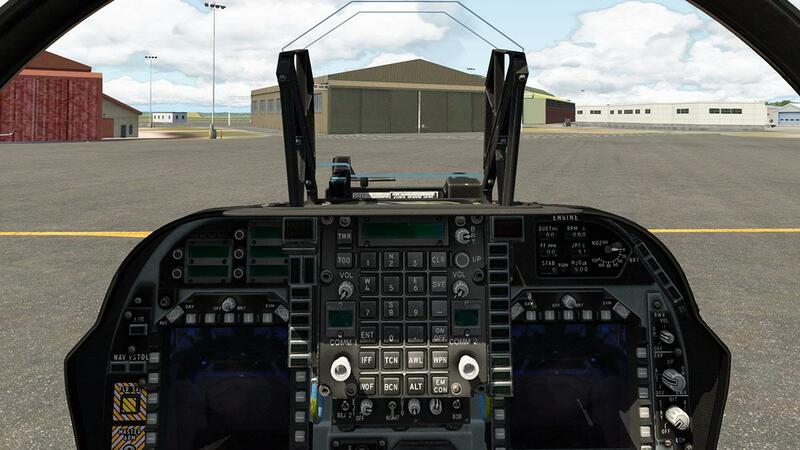 You can use the rearward thrust to slow you down... but the thrust differences between forward, hover (more heavy) to the rearward movement (less weight thrust) can upset your approach and make you lose height, so you use it sparingly, find that up-lift barrier and control the forward and descent movement and you can rest the aircraft easily. 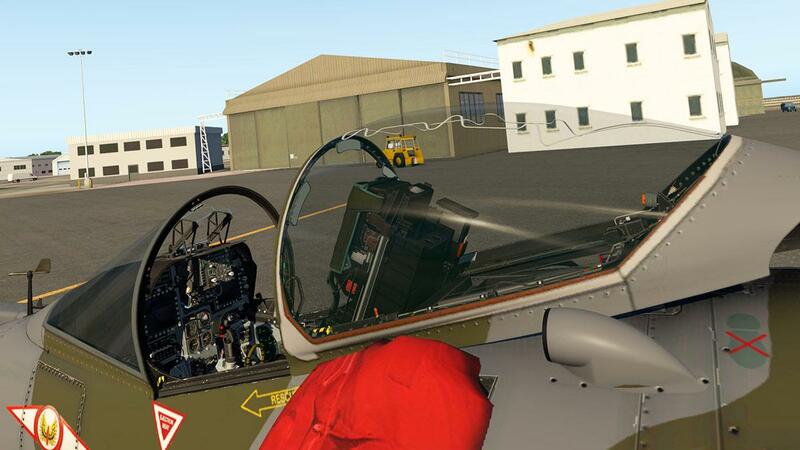 The nozzles can also be slow moving to a new position angle so the effects are not instantaneous, again you have to anticipate the thrust change and move the nozzles before you want to do a certain manoeuvre and be almost in front the aircraft. ... so if you keep that nose up angle and come in slightly moving forward the landing is usually very relatively easy and smoother, you just slightly bump the ground and move forward a few feet until you touch the brakes, but it is far more less stressful and a noticeably smoother landing.... you will notice on the videos that most runway landings are done in this way. 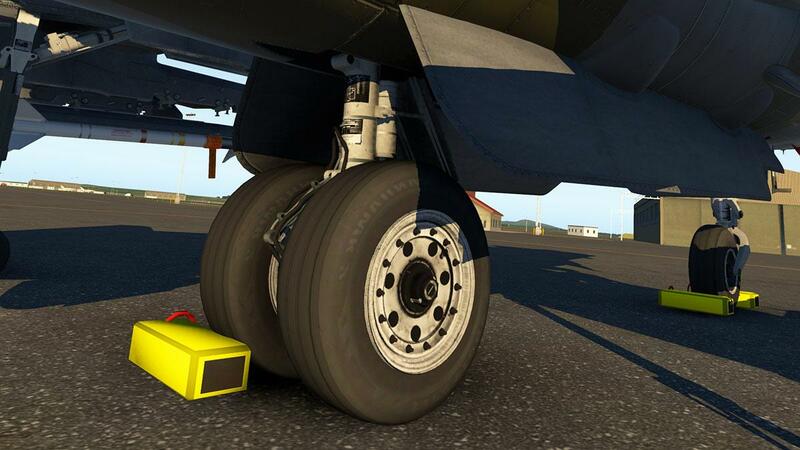 Taking off full loaded then you will need both the aerodynamic lift and downward thrust. You still put the nozzles about 50º and you are surprised on how much thrust (power) you have available, you do feel the push forward, but with the slightly downward thrust as well, takeoff is around 180knts depending on the weight, but it requires skill as the Harrier is balanced centrally with only out-riggers for balance. 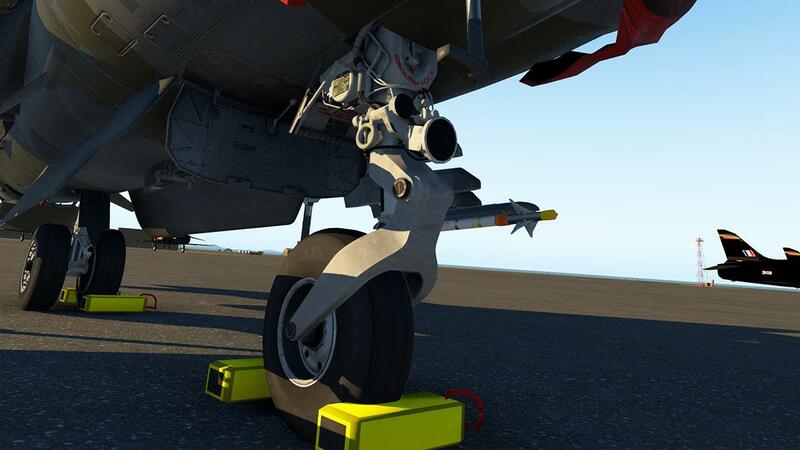 Don't move the nozzles into the 0º rearward position straight away and let the aircraft climb well clear before then slowly adjusting the angle of the thrust back to the rearward position. Use the "Carrier" button in the "Menu/Flight" to position you on the carrier. 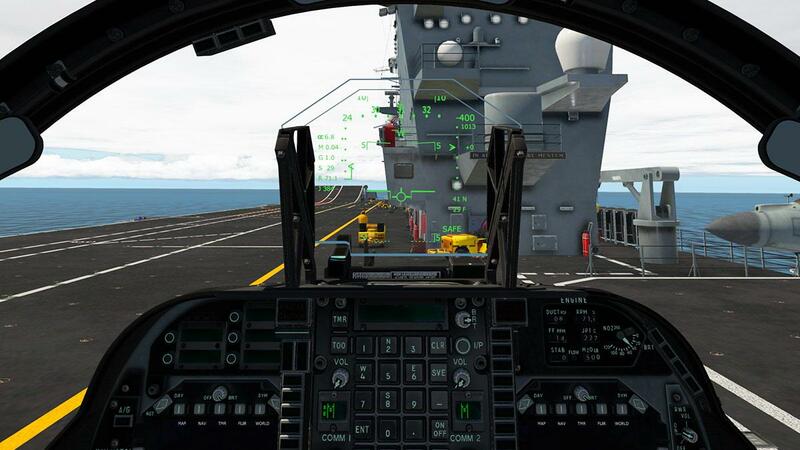 You find the first position will actually throw you burning over the side of the ship!, but do it again and you will this time stay on the deck.... the position is in an odd place just behind the ship's island, so you have to carefully move the aircraft almost directly to the left to get to the ship's runway, you can't loop around the deck either or go backwards, so it is a tight manoeuvre , but you can now sort of sit on the 500 marker. 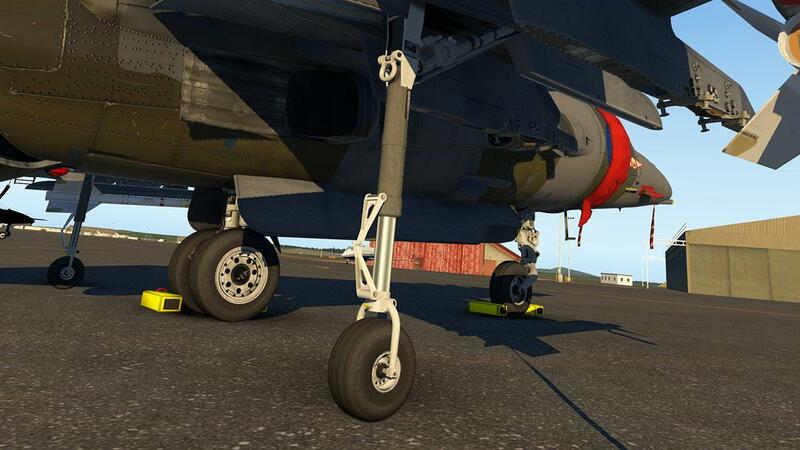 Again use the 50º nozzle angle and hold the aircraft on the brakes. 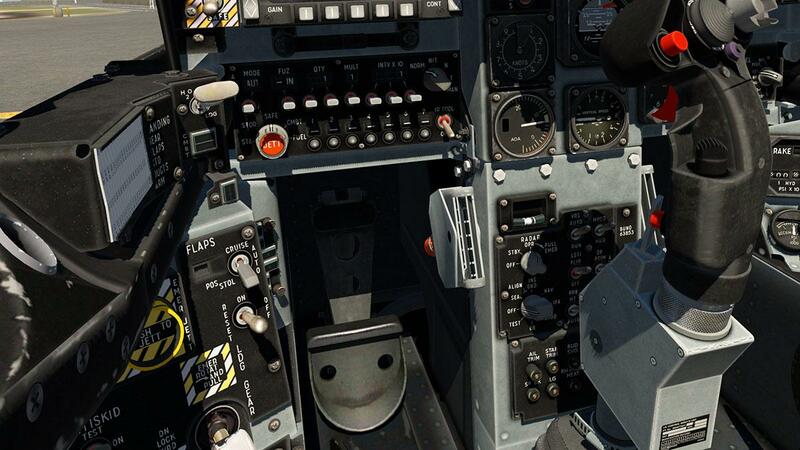 Your first thought would be to hammer the throttle full blast to get you airborne, but in fact that is the wrong thing to do? as you will hit the ramp too fast and you sort of compress the front gear into the deck and you will then bang your way upwards and go unwieldy into the air or usually over the front of the ship. ... climb out cleanly and start the mission. Landing back on the CAVOUR is slightly easier because the ship is moving forward, so it helps that high pitch angle approach. 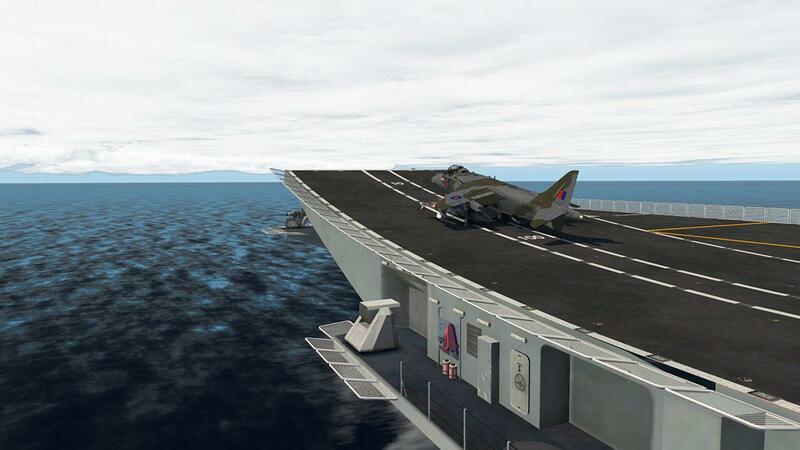 Most approaches are to the left of the deck at around 100ft then roll slow over the carrier deck and then reduce slowly your height, easy... well not at first, again if you want quick landing then come in slow over the stern and with a forward moving to stop landing on the deck is a still far easier approach. Once at speed you will need to switch the "Flaps" to "Cruise" (don't forget to switch them back to auto) to bring them up to the full 5º flight setting, you will feel the extra drag and lift, unless you do this. 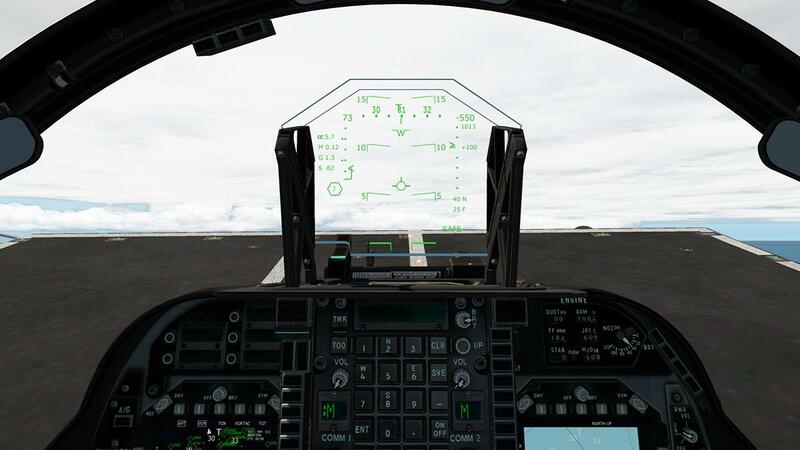 The HUD (Head-Up Display) is excellent, with a lot of detail that combines both Navigation and Weaponing data, Barometric Altitude or measured Radar Altimeter Altitude are both indicated as is the important Heading, Speed, Artificial Horizon, Horizon Reference, Weapons Status, Nozzle Flap position, Pitch Flight Director and Flight/Engine data. You can adjust the brightness from green to white. 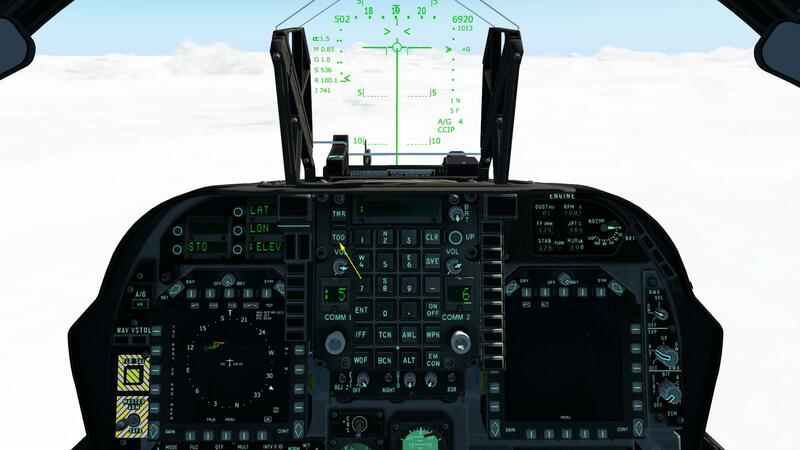 ... the Harrier will then realign to the heading exactly, mostly going in the opposite direction slightly and then centering the aircraft, to change altitude you just switch off the ALT and pitch up or down and reset at the new altitude. 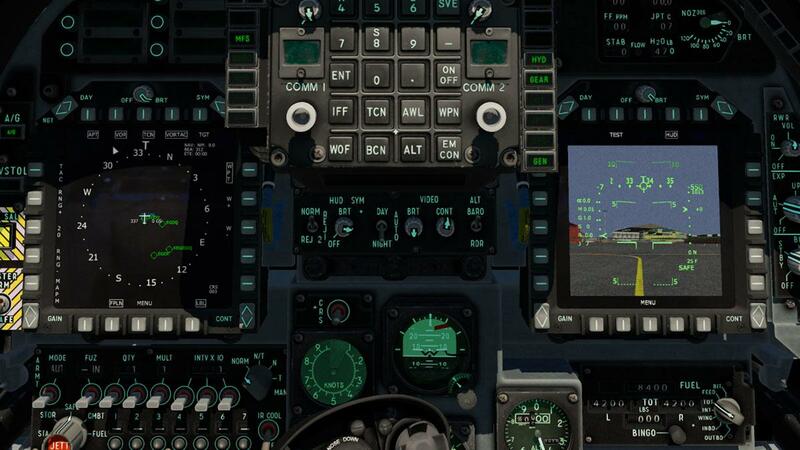 The in your face UFC (Upfront Control Panel) is easy to use once you have worked out what all the different actions are.... TMR (Timer), TOO (Target of Opportunity) are top left.... IFF (Identification Friend or Foe), TCN (Tacan), AWL (All weather Landing System), WPN (Weapons), ALT(Altimeters) and EMCON(EmissionControl). I/P, WOF (and no it isn't "What the F*ok") and BCN don't work at this point. And all the selected choices are shown in the top left ODU (Option Display Unit). The UFC scratch pad top is used to input the data and ENT to enter the data. Laminar Research have upgraded the "Weapon" feature in X-Plane over the last few years, but the 11.30 version gave with the particle effects the real "Wow" factor. 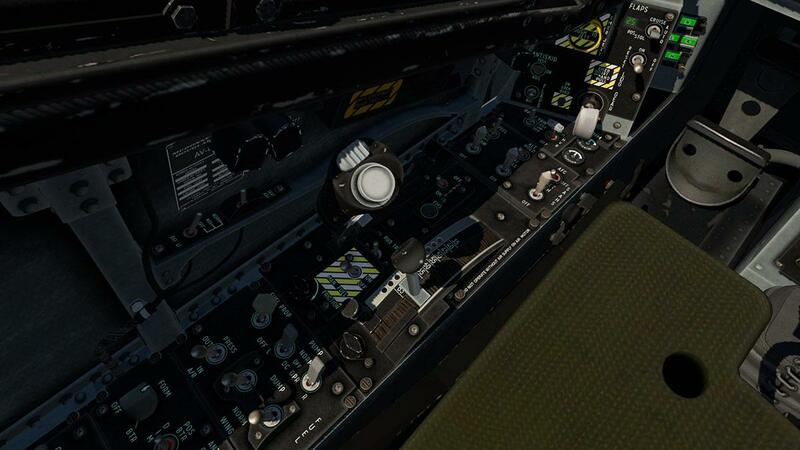 Main "MASTER ARM" is to your left... a layout of your armaments is shown on the MFD - MENU/MISSION/WEAPONS and also on the HUD lower right.... if you select the WPN on the ODU you can select which WPN selection you want to use in Air to Air, Air to Ground or use the Gun. There is a SAFE(ty) on both the ODU or the MFD to unlock the weapon. When you have all your selecting done, then when ready just "Fire!" 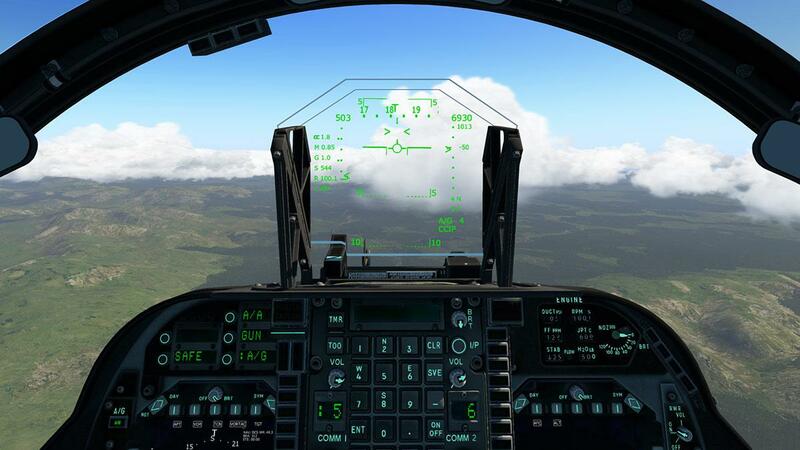 (X-Plane key or joystick command required). 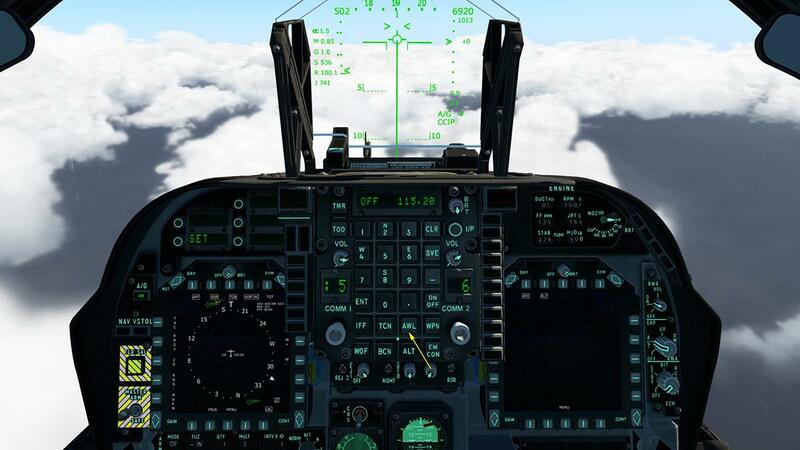 It is pretty spectacular... You can of course dump any armaments or long range fuel tanks in flight. There is really only two sets of illumination, with one the main panel and side consoles lighting, and all are adjustable. 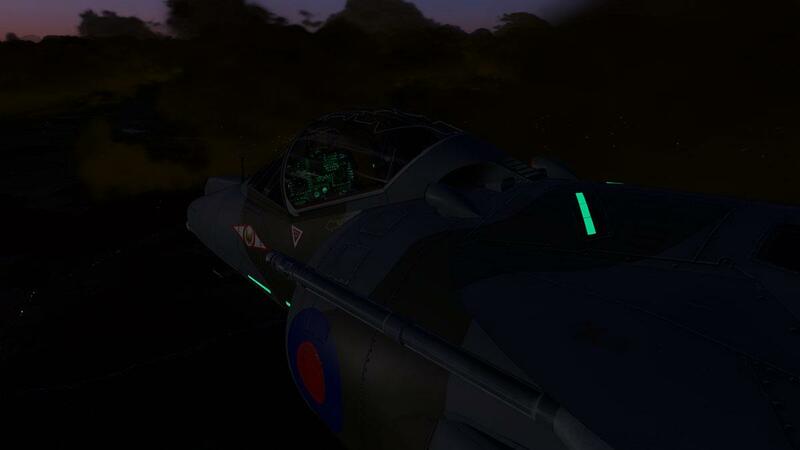 The second is the Overhead/Flood light that actually illuminates from the canopy sides, all are excellent. Externally there are FORM (Formation) lights and they are knob adjustable, POS (Position), ANTI COLL (Collision), AUX (Auxiliary - Taxi Light) and single landing light on the front strut. 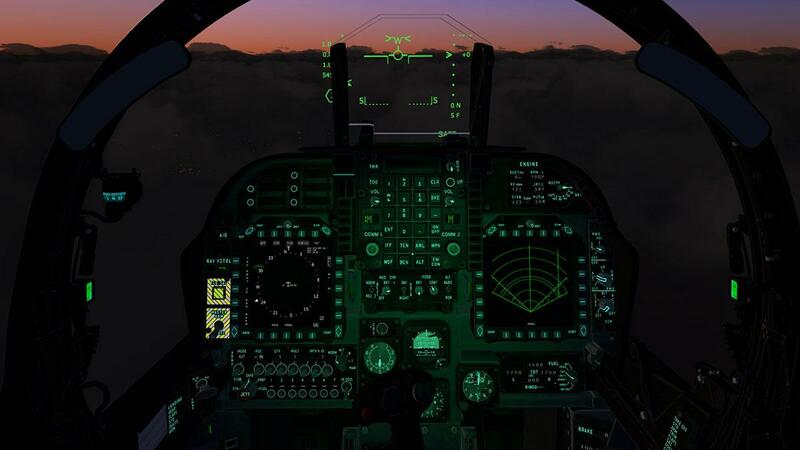 Various lighting modes allow full or dim position lights... there is also a NVG setting that turns off all the external lights and are then replaced by LED infra-red lights. 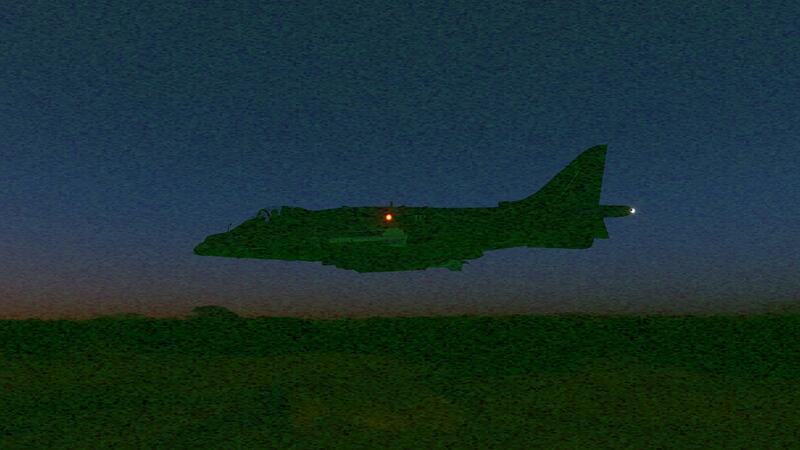 (see in X-Plane's "Night-Vision" feature). 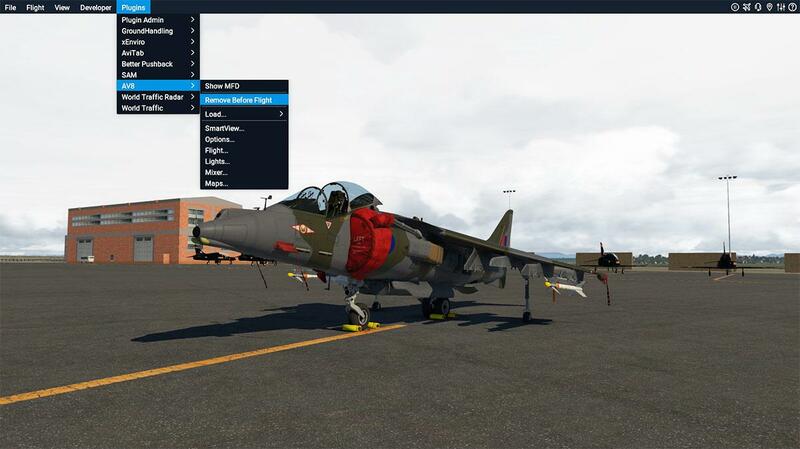 The bulk of the liveries are leaned towards the AV-8B operators, both with the US Marine Corps, Italian and Spanish airforces... the RAF does get a few versions put in there, but they are the more the odd ones than the earlier GR.3 or GR.5 liveries, the RN livery is not the main "Falklands" version either... note the different nose configurations with certain liveries. 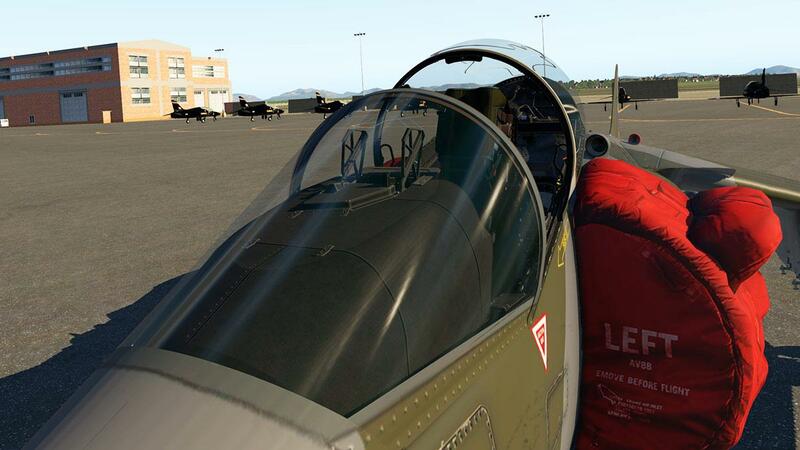 There are twelve hi-quality liveries as part of the package and a paint kit is available. 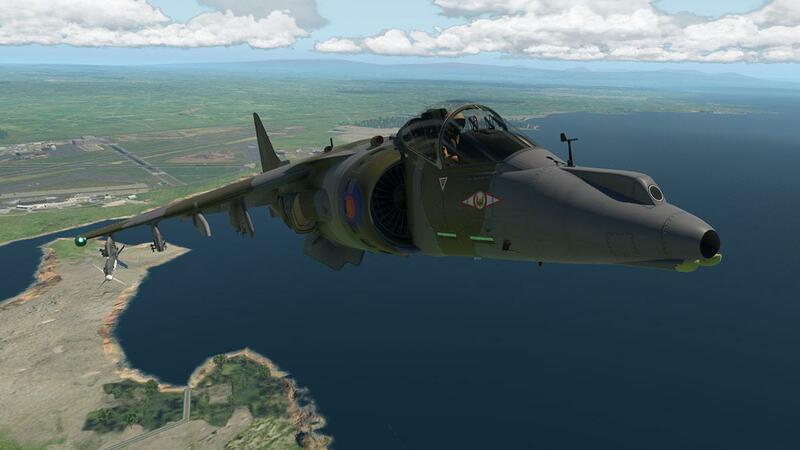 This is the "Harrier AV-8B GR3 XZ133 1982 Tribute 1.0" by Domhenry and was active in the Falklands, first from the HMS Hermes and then from Port Stanley. 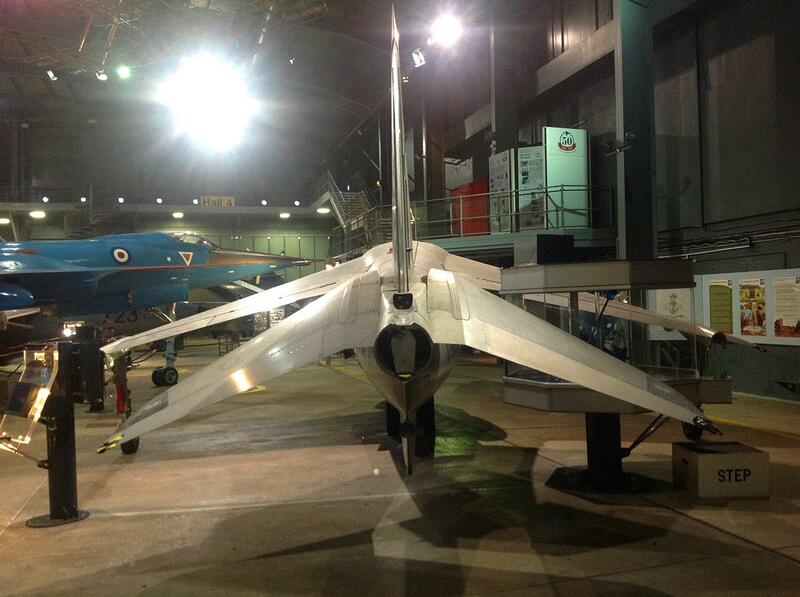 The aircraft is currently (hanging) at RAF Duxford... image noted above. The AV-8B is the second generation (discounting the prototypes) of the British Hawker Siddeley Harrier "Jump Jet", upgraded by McDonnell Douglas with a bigger engine, bigger wing and more armament attachment points and raised canopy, as it was eventually also used in the RAF as the GR.5. 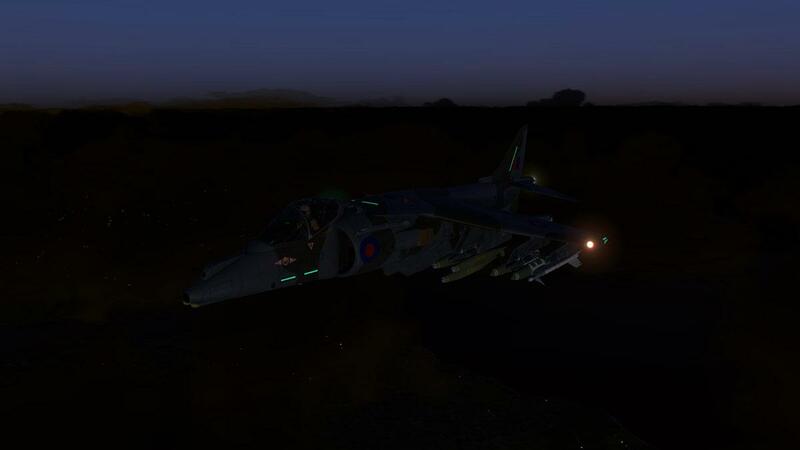 An outstanding versatile V/STOL aircraft, the Harriers capablities gave the aircraft a wide range of theatre roles and was the dominant force in the "Falklands War" in 1982. It was known as a "difficult" aircraft to fly, for the obvious reasons and the US Marine Corps have wreaked nearly 110 aircraft that have been damaged beyond repair since the type entered USMC service in 1985. 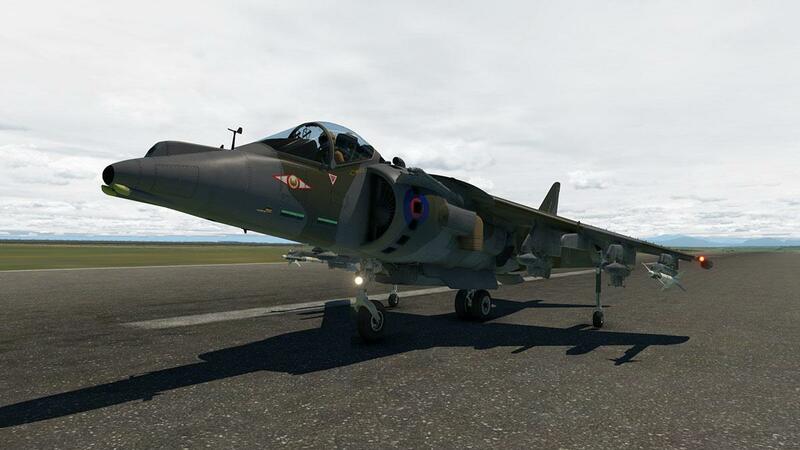 This not the first Harrier for X-Plane, but certainly the first in depth quality design from X-Trident, and was a follow on project from their earlier also excellent Pavavia Tornado GR4. 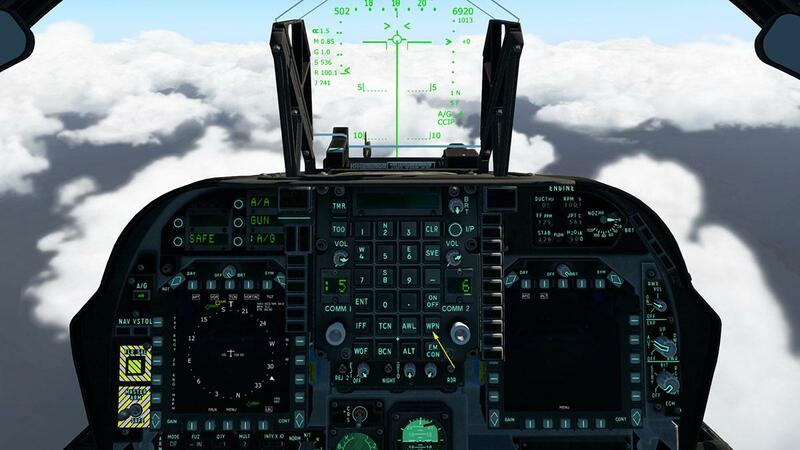 System depth including weapon systems with both CCIP and CCRP bombing modes, MFDs with click-to-lock A/A targets, UFC and CDU, highly detailed HUD with master modes and navigation with GPS (with moving maps, in scale with NAVAIDS) and TACAN (A/G and A/A). Fully detailed and authentic VTOL rotating nozzle and vectored-thrust control systems are really well designed and comes with performance and vertical flight controlability, sounds are also exceptional, and all through the full range of vectored thrust. 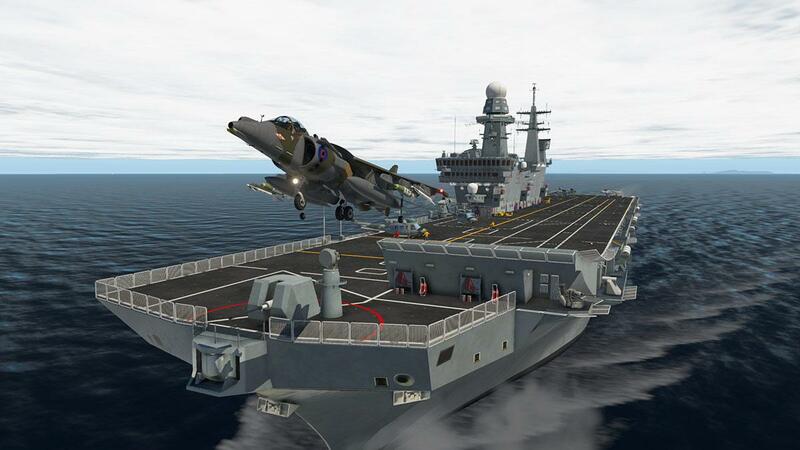 Added details includes 12 different armament configurations, custom Italiana “NAVE CAVOUR” Aircraft Carrier, in-flight refueling and placeable target ground objects. 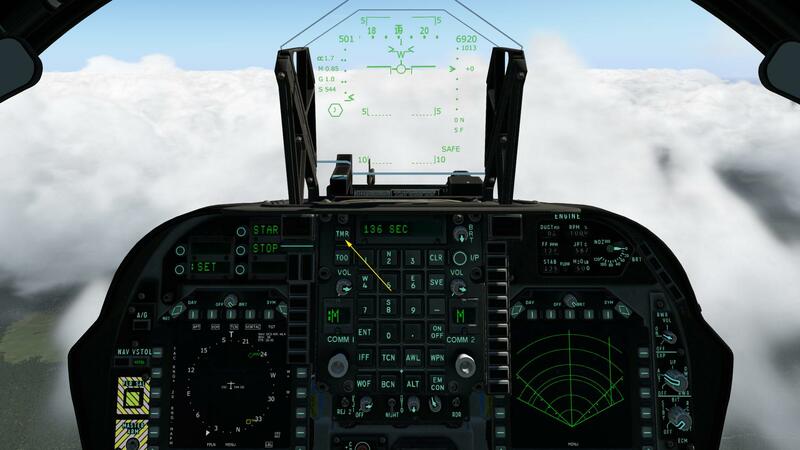 Negatives, not much, if anything... one click static elements restricts a lot versatile options on the ground and some external lighting could be more refined, the non-hideable stick hides instruments and a animated pilot would also be nice. 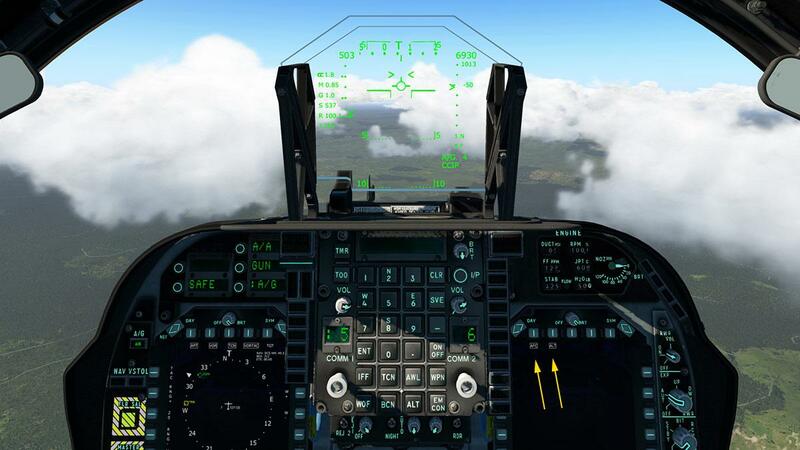 Mostly in this area you need to note that the Harrier is not the easiest aircraft to fly, and the systems are quite complex to learn and use (there is an excellent manual) so the Harrier is not for the unskilled or first time timers. Even if you are highly skilled the aircraft is still a challenge because this is an V/STOL unorthodox flying machine and not even your every day fighter aircraft, but authentic to the Jump Jet it is. 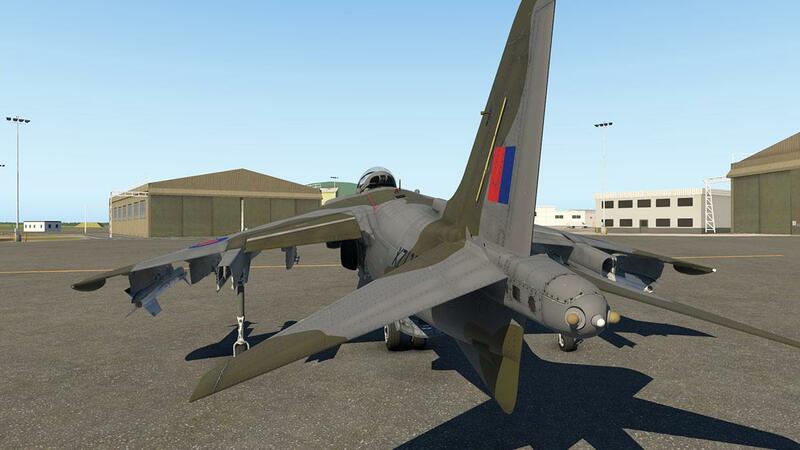 Overall X-Trident have done an exceptional job in recreating a classic revolutionary aircraft design, and highly challenging one at that. 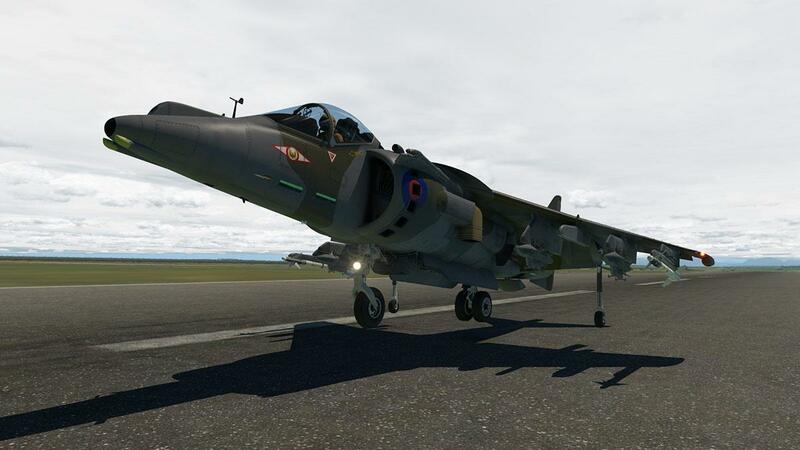 The quality in this fighter clas is now getting very high as is all of X-Plane aircraft of this detail and systems, but this AV-8B certainly delivers in all aspects of what you would want in flying the Harrier Jump Jet... Highly Recommended, but be aware as this is not your usual flying machine. 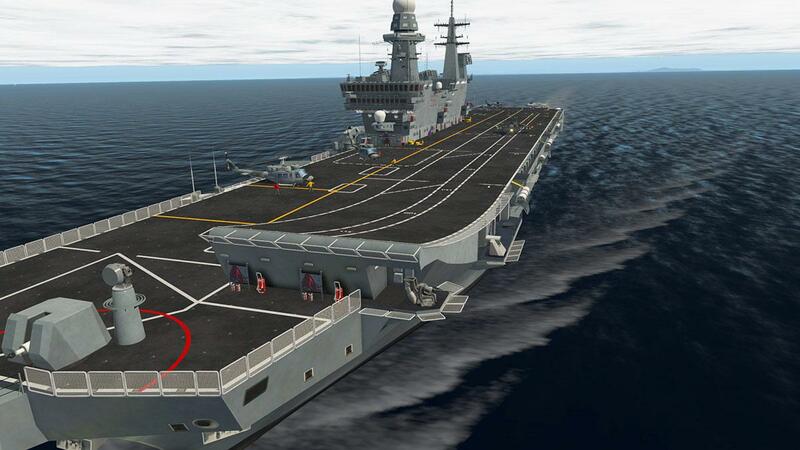 Installation of the Militare Italiana “NAVE CAVOUR” Aircraft Carrier is required for use, you replace the X-Plane default carrier Nimitz. 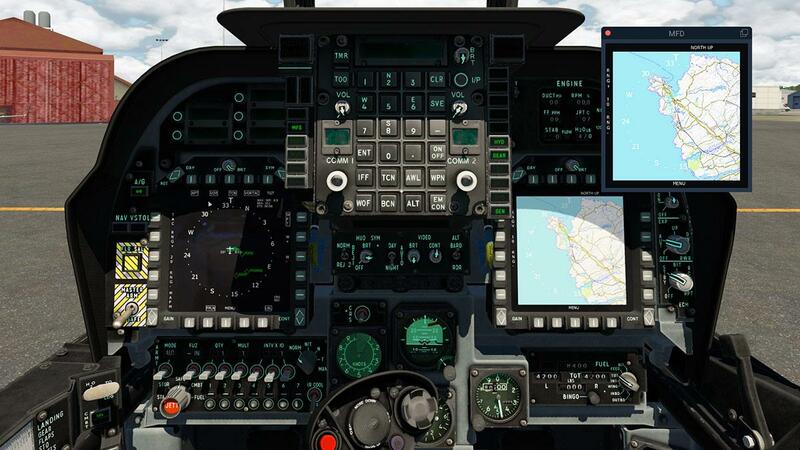 Weapon configurations are required before starting the X-Plane simulator and any custom targets have to be placed for use.